Size? was founded in 2000, and since then, they have become a household name, and have at least one store in every major city you could think of in the UK, along with expanding overseas last year into places such as Amsterdam, Paris, and Milan. With their growth, obviously comes power, and that’s not necessarily a bad thing, especially when it sees Size? being at the forefront of working with brands to dive into their archives and bring out retros/reissues of your favourite footwear models. Most people know Size? for the vast amount of footwear, clothing and accessories that they sell in their stores, and on their large online store, however, every now and then, Size? 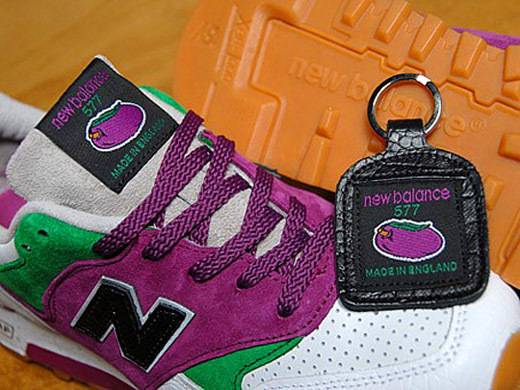 collaborate with brands on all of these things, and in the early 2000’s, they developed a pretty special relationship with the UK’s own division of New Balance. 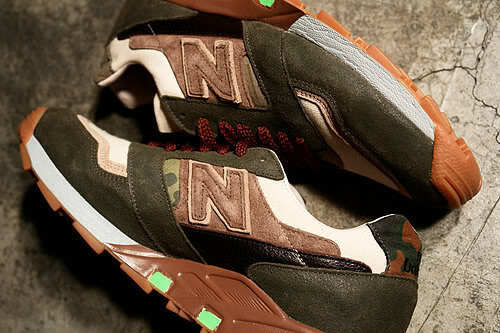 This post will take a look into the collaboration history between New Balance and Size?, however, the further back we go, to their first lot of collaborations it’s really tough to get good information as there is little to none on the internet, and unless you were around at the time, it’s pretty much impossible to source the information and pictures needed. Luckily, if you dig hard enough, there are various pictures around, and these rare pairs pop up on social media now and again which is great to see. Also, I know some pretty great people who have vast amounts of knowledge from this time so they were a huge help. 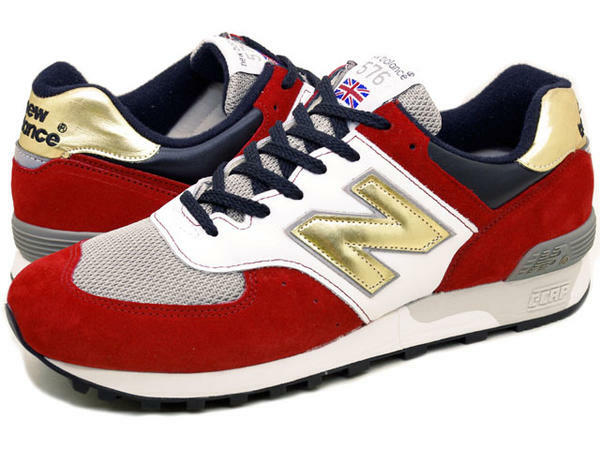 Anyway, in the early 2000’s, this was a time when New Balance collaborations, particularly Made in England pairs, were of a level of quality that will probably never be reached again. 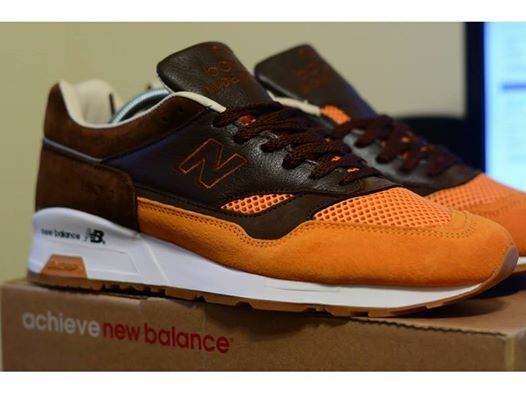 There is just such a vast amount of amazing colourways out there that also used some pretty exceptional and unique materials, and this is something that set NB apart from every other brand, and one of the reasons why I take such an interest in the brand. There’s no better example of the excellent work that the Flimby factory do than these early Size? collaborations, and credit to the people at Size? who came up with the colourways and material selections. This set of 4 pairs of 577 uses some of the best leather and suede around at the time, and comes in four simple, but yet stunning colourways. 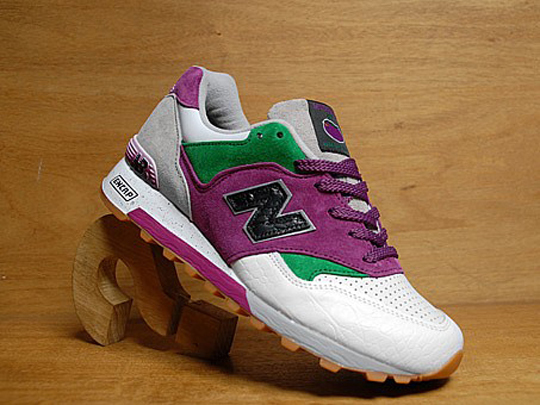 The first is the New Balance 577ASZ, and is probably the rarest of the four now, as it never really gets seen these days. It has a predominantly leather burgundy/maroon upper with grey suede accents, and features perforated leather on the toebox. 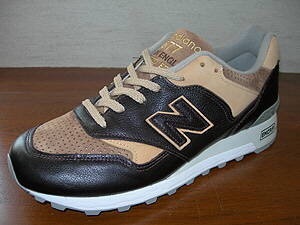 The second pair from the set is the New Balance 577BSZ, which uses various shades of brown leather and suede, again featuring a perforated toebox. Third up is the New Balance 577GSZ, again utilising premium leather on the predominantly green upper, with some clean white perforated leather on the toebox to finish it off. Last but not least from this set is the New Balance 577SSZ, and is probably one of the pairs that we see the most from this pack. This pair features a mainly light blue upper with some dark blue and off-white coloured accents, and keeping in with the tradition, it has a perforated toebox but also has a gum outsole, which is something the others don’t have. New Balance was founded in 1906 as ‘New Balance Arch Support Company’ and when 2006 came around, it was time to celebrate New Balance’s 100 year anniversary. 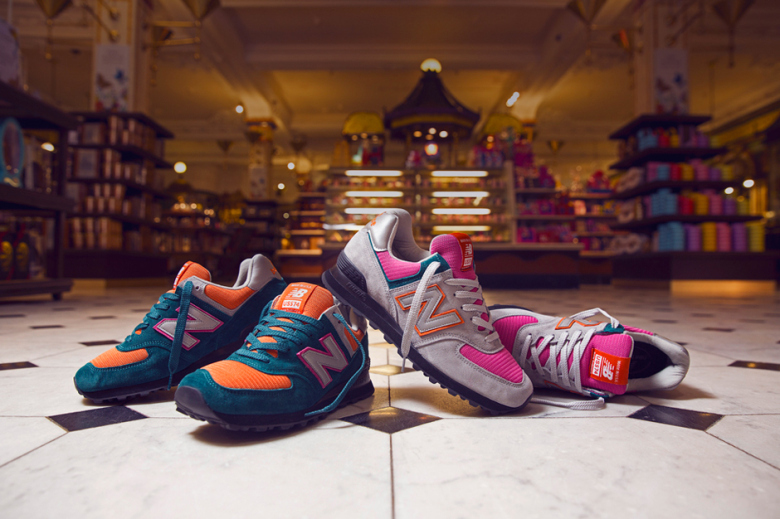 For this celebration it was inevitable that NB were to produce a good few limited edition pairs of shoes, and along with the three limited edition trainers to honour it’s three longest serving employees; Audrey Stewart, Ian Byers and Victor Dixon, there were also to be a run of New Balance x Size? collaborations. Much like the collaboration in 2005, these are some of the best pairs to ever come from Flimby, and Size? excelled in utilising the black midsole, something which has only been done well very few times. 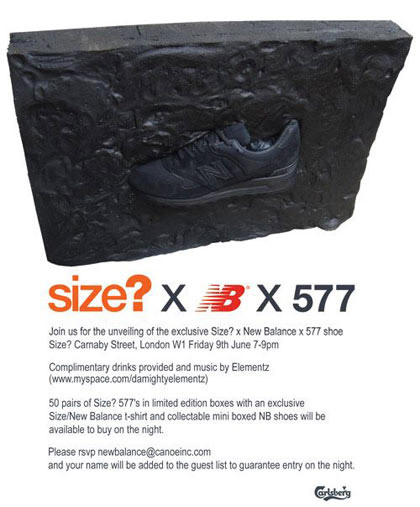 Below is a picture of the invitation that was given out for the special instore launch of the New Balance x Size? 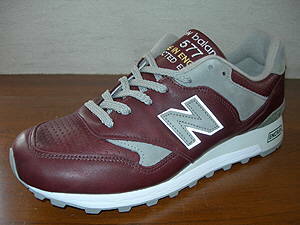 577 release in 2006. 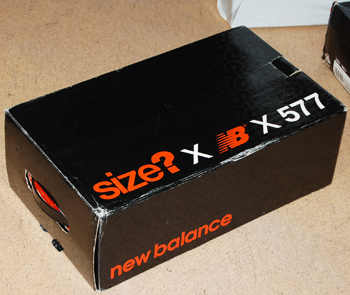 There were 50 pairs which came with a larger special box which housed the standard Made in England New Balance box, and it is pictured below. They also came with miniature versions of the shoes and box, as well as special t-shirts made for the release and these were only available at the instore event at Size? Carnaby Street. Size? and New Balance created a pretty amazing pack named the ‘coup d’eclat’ and it was spread over several months throughout 2006. Each pair from the pack was based around a black and orange midsole, which is why these two colours are so prevalent throughout the uppers on each pair. Each shoe used a mix of vibrant colours and some of the most premium materials available, including suede, mesh, and camo print leather. As well as the release dates for the shoes being staggered throughout the year, they also had different quantities, which were all extremely limited. The first release was in June of 2006, and it featured 4 colourways; BGO, BGW, BWB, and PGB. 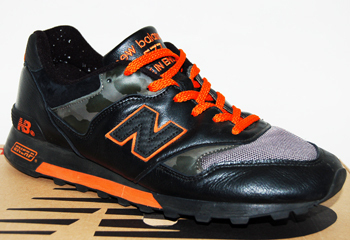 Every shoe in the pack stands out on it’s own, but the New Balance 577BGO is particularly great because of the camo leather on the upper, and this pair was limited to 120 pairs. 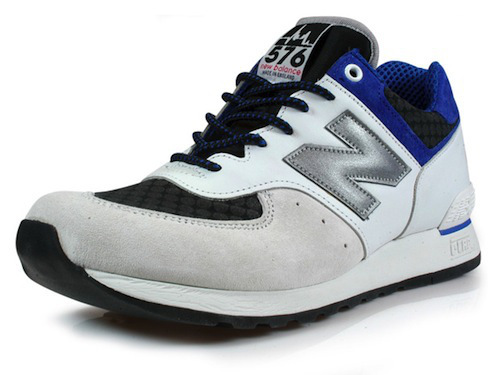 The New Balance 577BGW was meant to be limited to 90 pairs, and was designed by Matt Taylor, but the story goes that when they visited the Flimby factory, they chose some colours that were near the end of their rolls, so fewer pairs were made than planned. 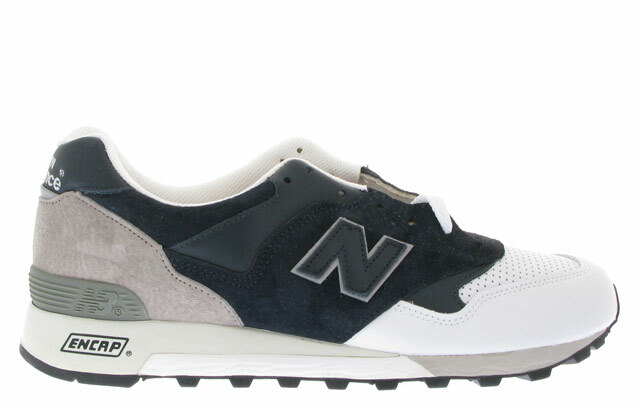 Thirdly, the New Balance 577BWB seen a release limited to only 70 pairs, and was the second most limited out of both drops. 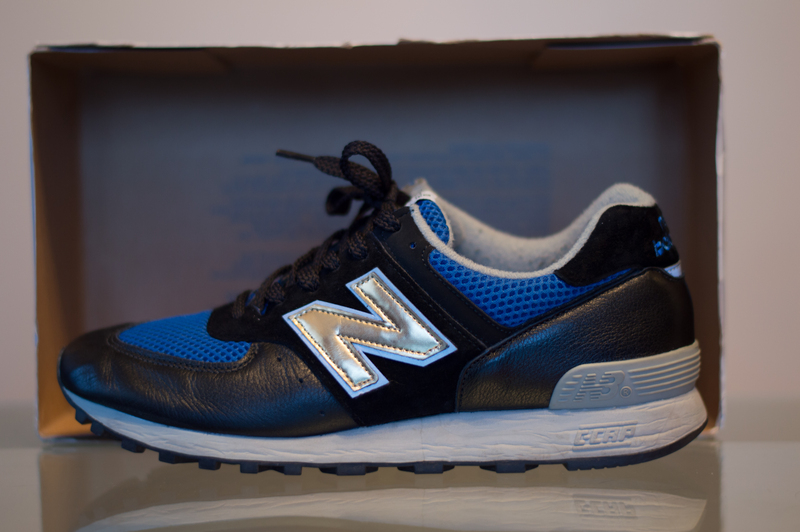 Last but not least from the first drop, the New Balance 577PGB designed by John Brotherhood was the most limited of all the drops in 2006 as it was limited to only 60 pairs. 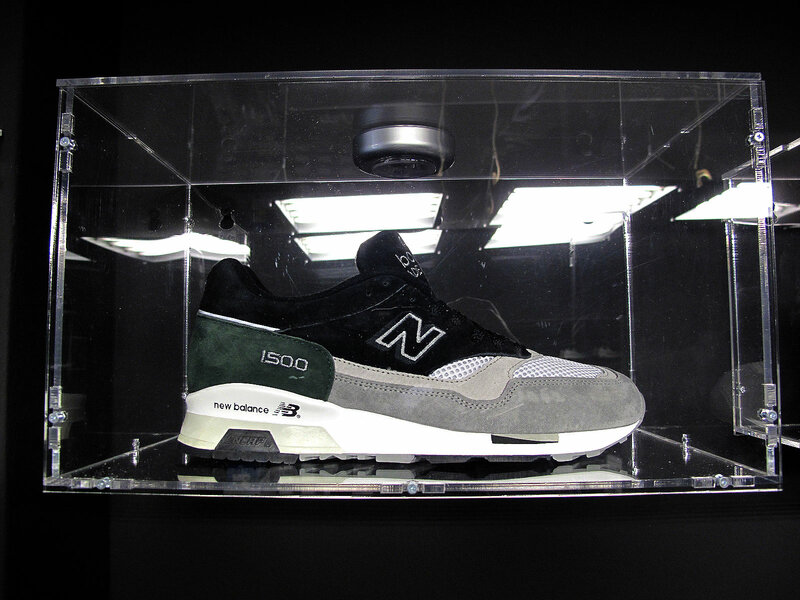 Following on from the first drop, the second drop featuring two pairs of 577 was released in November, and both these pairs were limited to 75 pairs each. Back again with more 577’s, one of the most iconic UK Made models, and this time, this pack features some very fruity designs, with an array of pinks, purples and cyan teamed with a splattered midsole. The shoes feature faux reptile skin on the upper, teamed with lush suede and perforated suede or perforated leather on the toebox. The shoes were designed with old school fruit machines in mind, think one-arm bandits, bright flashing lights and 3 fruit jackpots of Plums, Strawberries and Bells. The colour scheme is no gamble (excuse the pun), and it was styled by one of the Size? crew from the Birmingham store. 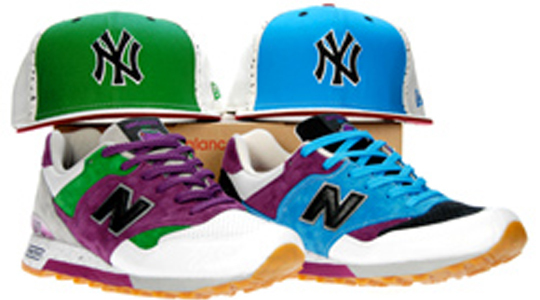 Both colourways were limited to 250 pairs, and there were also matching New Era caps for both colorways, which were only available instore. The shoes also came with matching keyrings, check them out in the pictures below. That wasn’t all though, along with the release of the ‘Fruity Clerks Pack’ came another shoe, and probably the most elusive of all Size? 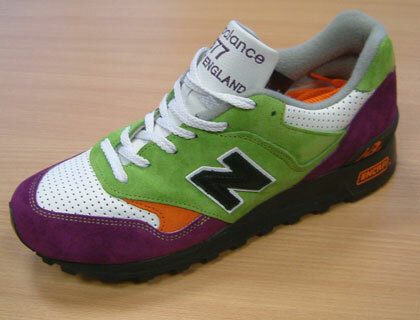 collaborations, and maybe even New Balance UK collaborations – the ‘Jackpot’ 577. 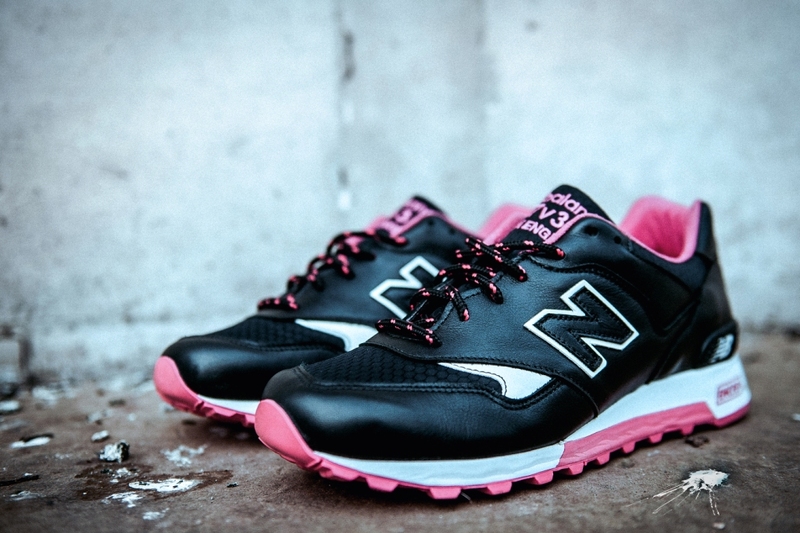 The ‘Jackpot’ 577 were made exclusively for a competition and limited to only 4 pairs. Along with the ‘Jackpot’ 577, the first prize winner will take home one of the 2 New Balance Fruit Machines that were installed in Size? Carnaby Street and Covent Garden Stores at the time of release, and the second prize will win a pair of the Jackpot 577 shoes. 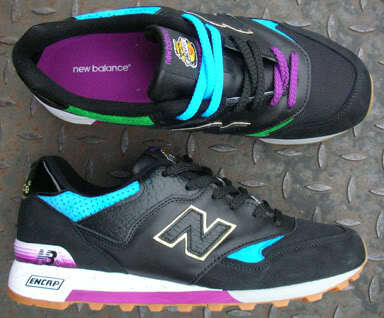 The New Balance x Size? 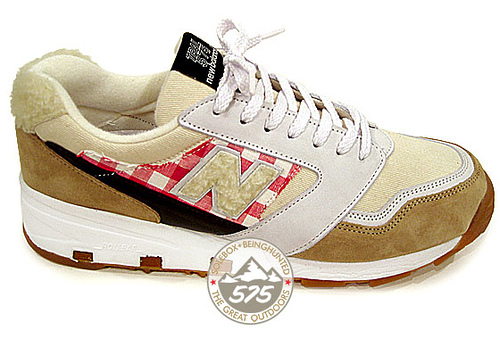 577 ‘Estates Pack’ was brought out in 2010 to celebrate the stores 10 years anniversary, and the pack draws inspiration from the gradual transition of practical rural fashion into a modern trend in the city. This shoe pays tribute to the modern city gents adaptation of traditional rural wear with a premium black leather and suede upper, mixed together with a woven quilter toebox and heel support. This pairs comes in a mix of dark green, brown with popping orange accents in a leather and mesh upper, and the shoe is inspired by rural British fashion worn by city dwellers. Both pairs are sat on a clean white traditional ENCAP midsole, and have a gum outsole. They also have a woven brand tab sewn onto the tongue and it transforms the style number into roman numerals (DLXXVII = 577) with ‘shoe maketh the man’ in Latin underneath the crest. As always, a shoe isn’t really complete without a little bit of 3M, and this comes in the form of the N backer for both pairs. Limited to 250 pairs each. 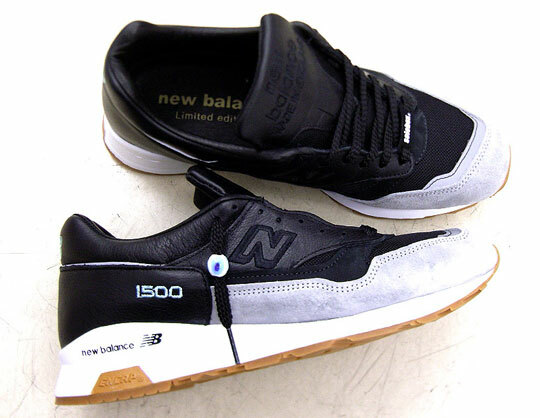 Staple Design aren’t new to collaborating with New Balance, and neither are Size?, so when these two came together, we expected something special, but we’re not exactly sure that these shoes lived up to that expectation. Nevertheless, both Size? 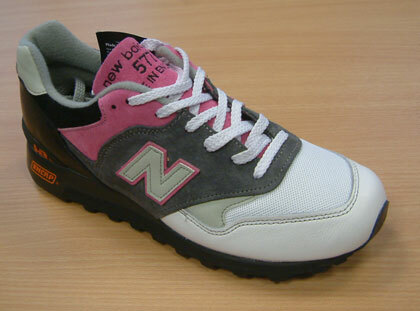 and Staple Design reworked a 577, a model which Size? have became so well known for collaborating on. This Made in England 577 came in a year that was celebrating 30 years of manufacturing at Flimby, and as always, this shoe features only the most premium of materials. With the ‘Black Pigeon’ toughened up on his travels, the shoe features a heavy-duty construction with a honeycombed rip stop nylon toe-box and robust leather upper. Not forgetting the creature comforts, a soft pink felt lines the inner and adds extra warmth. Over the last few years, it probably felt like there was a Size? store popping up in every UK city, and even expanding abroad into other countries, a true testament to the size at which the retailer has grown. So, on that note, to mark the occasion of Size? 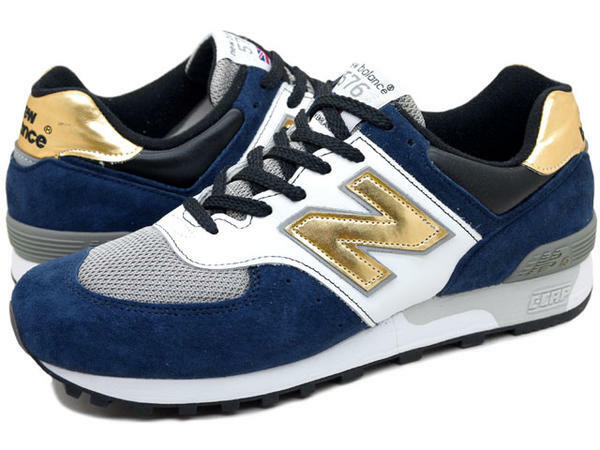 opening their first pop-up in the world famous Harrods department store, they once again teamed up with New Balance, but this time, they created two Made in USA 574’s. The pack was inspired by Harrods’ colourful food hall, and we see two bright colourways of the premium suede and mesh US574’s. One of which has a Miami Dolphins-esque colourway of teal and orange, with hits of pink and grey, while the other has the inverse – grey and pink, with orange and teal accents. 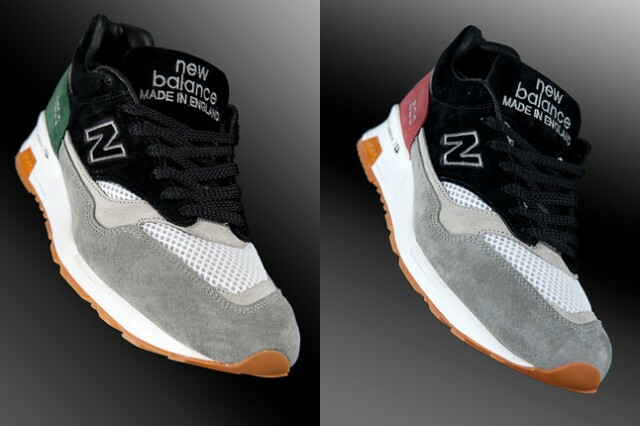 Both colorways will only be available in a run of just 12 pairs each, making these some of the most exclusive New Balance collaborations yet. 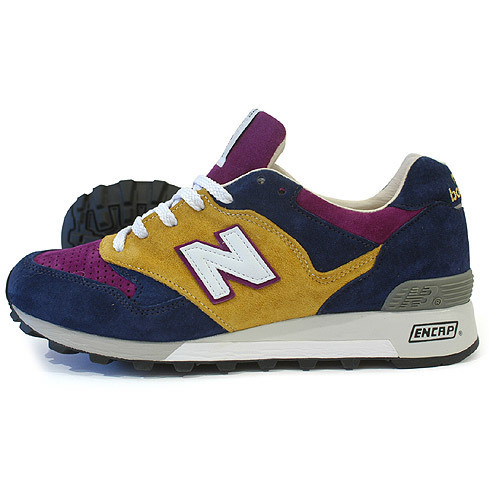 However, it was possible to create extremely similar colourways via the NB USA custom site if you happened to miss out and desired a pair of 574’s in either of these colourways. If you have even the slightest of interest in the footwear industry, then there’s almost no doubt that you’ll have heard about German heavyweights Solebox; a boutique run by brothers Hikmet and Suekret Sugoer, based in the Germany’s capital, Berlin since 2002. Over the years, this boutique has grown massively in popularity, and has amassed a huge following of local customers, as well as all those who frequent the online shop, and is widely regarded as one of the best sneaker boutiques in the world, a true testament to the work of all those at Solebox. You get the feeling that Solebox was started up for all the right reasons, with a love of sneakers and community spirit at the forefront, and that’s been apparent constantly, with little things such as Hikmet’s continual online presence, whether it’s frequenting forums such as the once legendary Crooked Tongues, engaging on Facebook directly with the sneaker world, or the vast amount of excellent collaborations that they have worked on over the years. 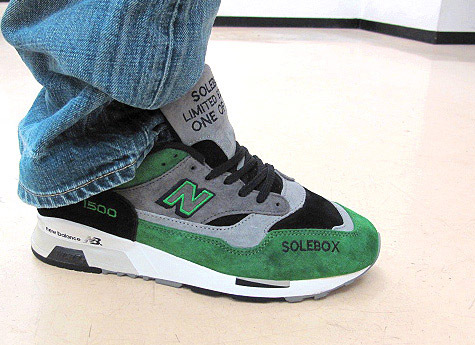 Now that I’ve mentioned collaborations, I might as well get right into the thick of it, and you could compile a long list of Solebox collaborations over the years, with many of the heavyweight brands, but I’m going to specifically focus on New Balance. Currently, out of all the New Balance collaborations in general, the Solebox ones are probably the shoes which seem to go for the most extortionate amounts of money, but it’s no surprise when you look at the models they have worked on and the colourways they have designed over the years. 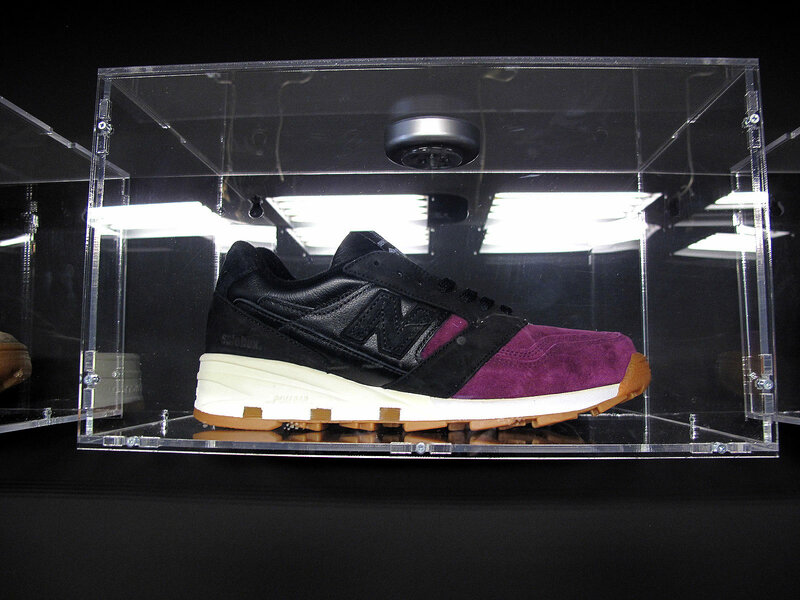 Much like some of the other European stores, such as Hanon Shop and Sneakersnstuff, Solebox built up a strong relationship with New Balance UK and were one of the early collaborators, which seen a run of twelve released shoes, among the many unreleased samples. Picture from 10 Years of Solebox Blog. The New Balance 1500GGB “1of150” was the first of a long run of great collaborations between Solebox and New Balance, but there’s absolutely no gimmicks with this shoe, just an absolutely timeless colourway that speaks for itself. The shoe features grey, black, and forest green suede with a clean white mesh toebox, white midsole and grey/black outsole. As the name suggests, there are only 150 pairs of this shoe, and to acknowledge this, Hikmet provided laces with Solebox and 1of150 on them. Thanks to Decktwo/Thomas for the image. The New Balance 1500BB x Crooked Tongues x Solebox “Bread and Butter” is ultimately one of the rarest pairs of New Balance to this date, with only 50 pairs released, however, there are a number of personalised pairs out there so we think the number may be a little more. Nonetheless, the more the merrier, as this shoe is great, and it is the perfect product of when two great minds – Chris Law of CT and Hikmet of Solebox – come together to produce a stunning collaboration. This pair takes it’s name from the Bread and Butter tradeshow at which it was released back in 2005, and as you might have gathered already, it was a joint collaboration between Crooked Tongues and Solebox, with the colour way inspiration drawn from CT’s website colours. The shoe features burgundy suede, black mesh, concrete coloured leather, the infamous carbon effect, gum outsole, and each pair came with a numbered metal lace jewel. The “Purple Devil Pack” is some of Solebox’s finest work, and the style of colour blocking used has clearly inspired many brands and stores over the years. 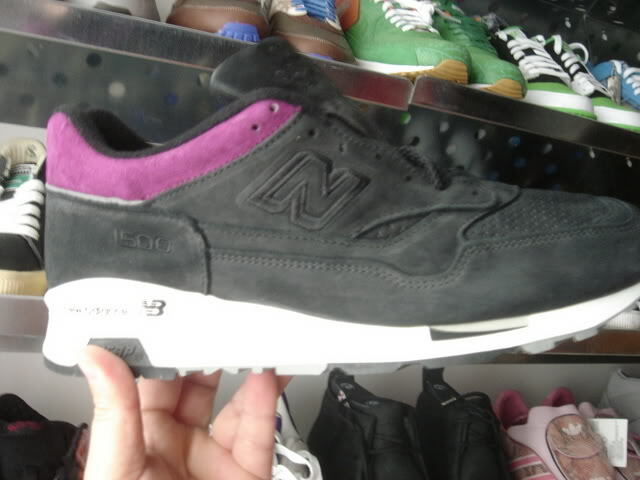 Another thing that I like about this pack is the use of the plum wine suede, as this is one of New Balance’s most notable colours, being used on iconic shoes such as the original 1500PW “Plum Wine”. 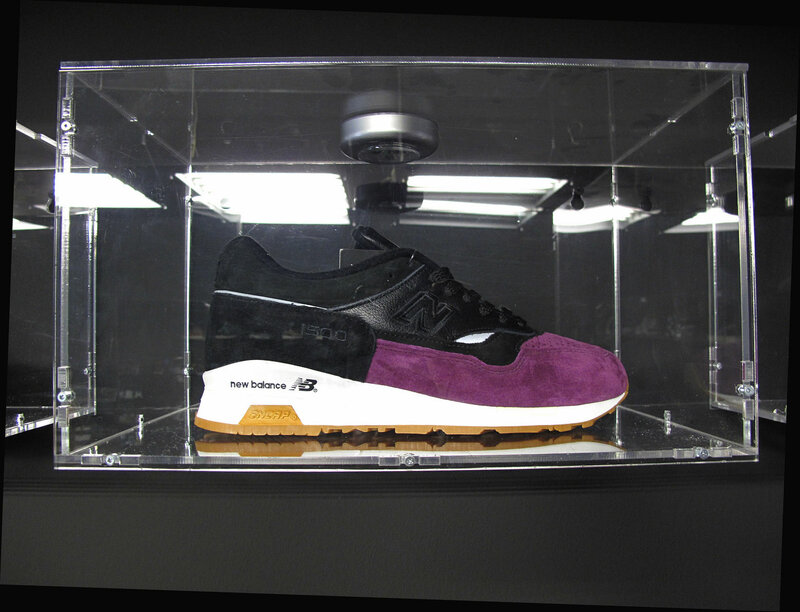 When you read through this post, you’ll start to realise that Solebox established a number of traditions while working on their New Balance collaborations, and one of those specifically was the all-white midsole with gum outsole, and the “Purple Devil Pack” was the first in the series to use that. 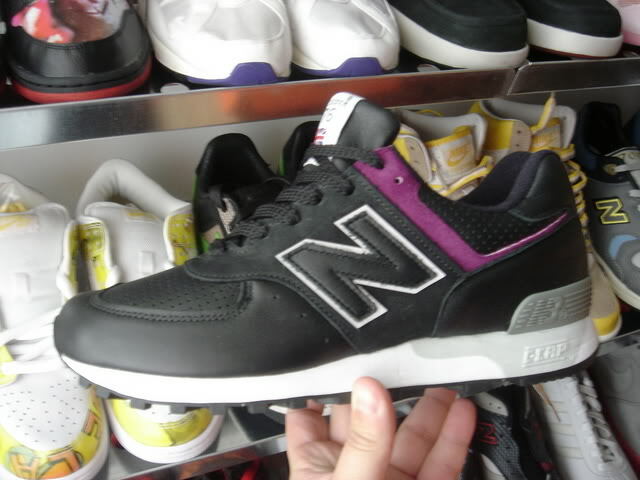 The New Balance 575BPW was the first in the series of the “Purple Devil Pack”, and each shoe follows the same style of colour blocking, material use, and midsole style. 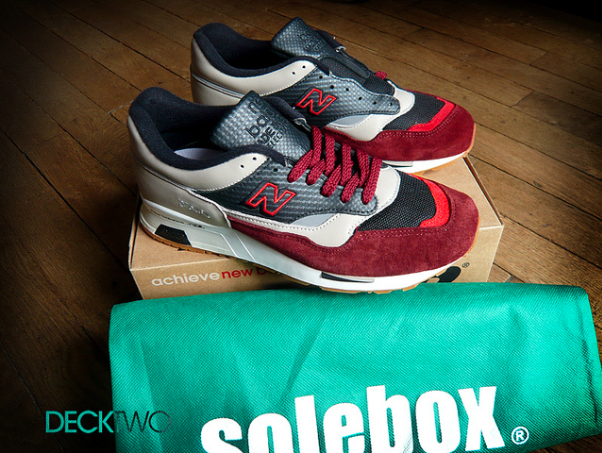 This pair was released in May 2006, and 120 pairs featured the Solebox branding on the side, which you can see int he picture above. The second instalment of the “Purple Devil Pack” was to be a 576, a iconic UK Made model, and one which many may have preferred after the earlier 575. 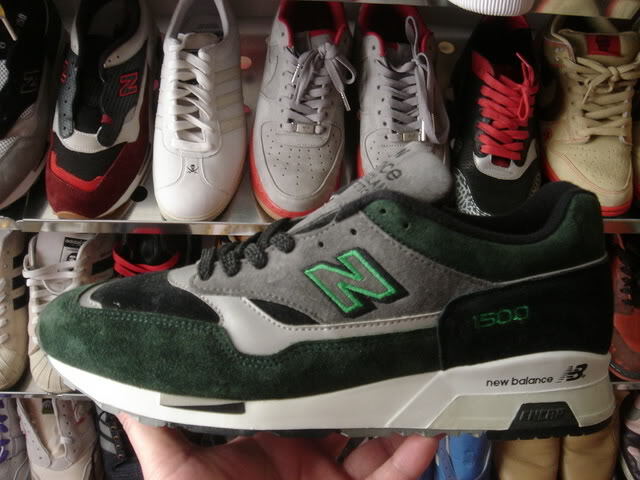 Again, the shoe followed the same colour blocking, material choices, and sole unit as with the 575, and the 1500 to come, but with a hint of 3M for an N backer. I think at the time, the 1500 from the series had already been announced but then delayed, so I guess it was for the 576, it makes sense, right? This time around, Solebox had enough plum wine suede left to up the quantity of the 576BPW to 300 pairs, giving many more people the opportunity to own a pair. 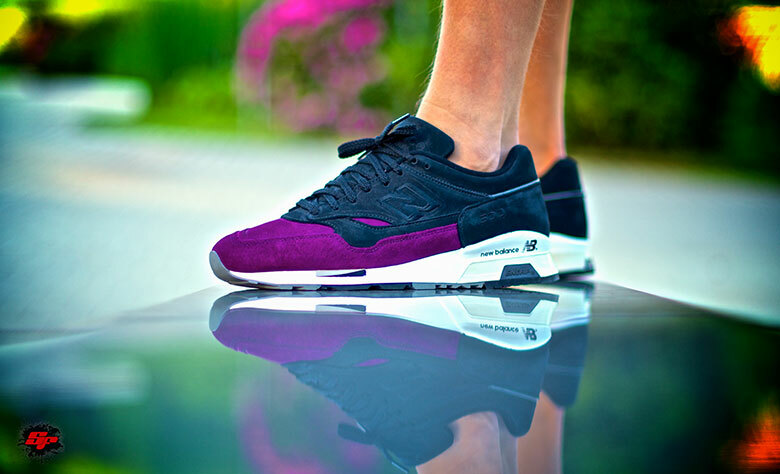 The heavyweight of this pack, a shoe that really needs no introduction as it’s one of the most sought after pairs of New Balance 1500’s out there, and it’s no wonder really, as the Purple Devil colourway on this model is next level. This shoe has everything, buttery plum wine suede, and perf suede on the toe box, lush leather, 3M hits and 3M piping around the heel, and the traditional white midsole and gum outsole. 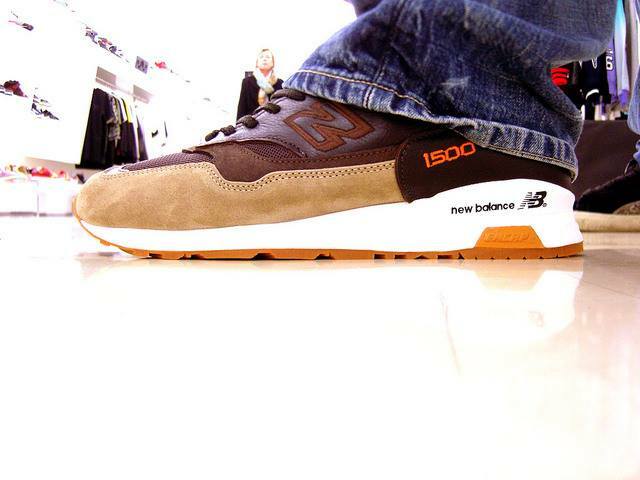 Like the 576 before it, the 1500BPW was also limited to 300 pairs. 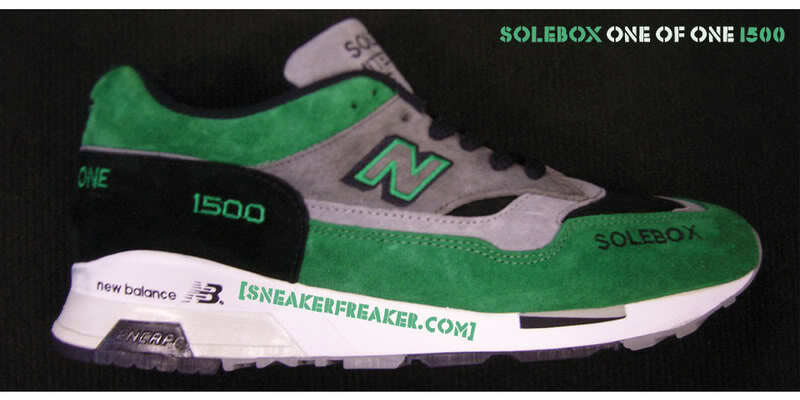 In 2006, Solebox and Being Hunted came together to collaborate with New Balance on a pack of two 575’s named the “The Great Outdoors”. “While nowadays the design of outdoor apparel and footwear is dominated by the use of high-tech fibers, our concept was to apply to the shoes only traditional, well-tried materials such as cotton, linen, sheepskin, and various types of leathers. For the actual design of our 575s we chose to distinguish between two general characteristics of outdoors acitivities: military and civilian. Our aim was to establish two very distinct and diverse fields which through the design could easily be identfied on both versions. 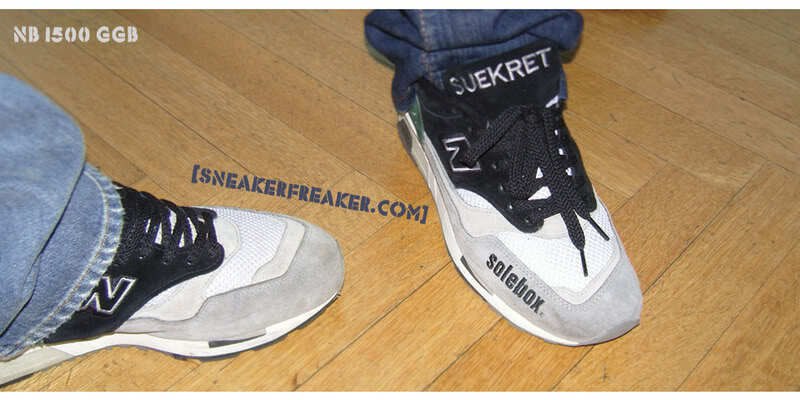 The release of these shoes came in two stages, with Solebox releasing their’s first at the start of 2006, and Being Hunted following roughly a month later with their release. Both colourways were limited to 60 pairs each. 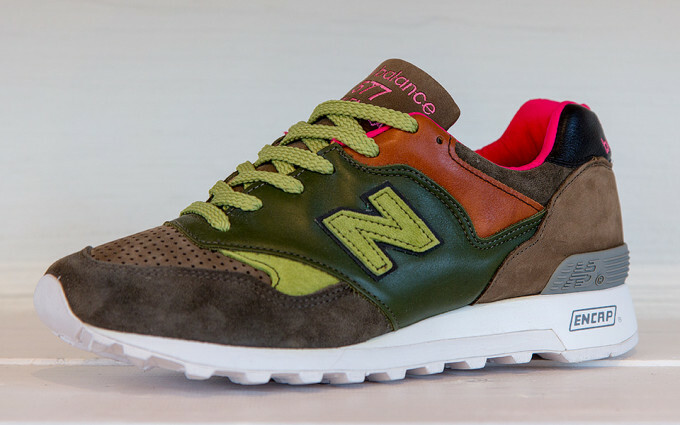 The 575SEW “Military” designed by Hikmet of Solebox used a Stricktarn fabric which is a camouflage used by the former East German armed forces, and the original camouflage fabric was bought in Berlin and shipped to Flimby for manufacturing. 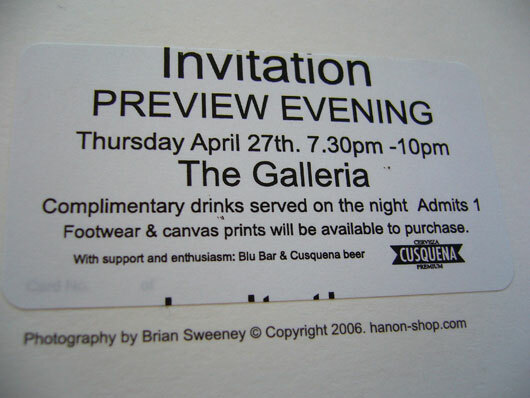 This sourcing of materials by stores for their collaborations was very common around this time. The 575BNW “Civilian” designed by Jörg of Being Hunted used a Gingham fabric which is commonly found in Southern German attire and as Being Hunted’s roots lie in Munich, this is where the fabric was sourced from. 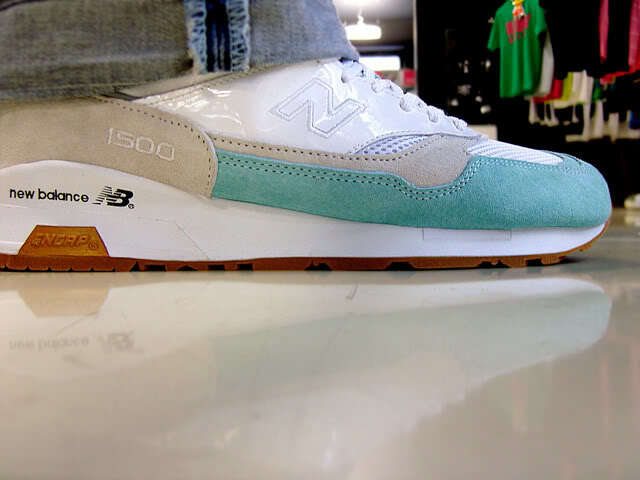 In 2007, for the third year in a row, Solebox came together with New Balance and pulled together another stunning pack, and this time it was named the “Toothpaste Pack”. As you might of been able to guess from the name, the shoes draw inspiration from toothpaste, which might seem weird, but it works, and works well! Each colour way represents a flavour of toothpaste, mint and orange, with a mix of suede, patent leather, the return of the mesh last used on the GGB, and a gum sole. 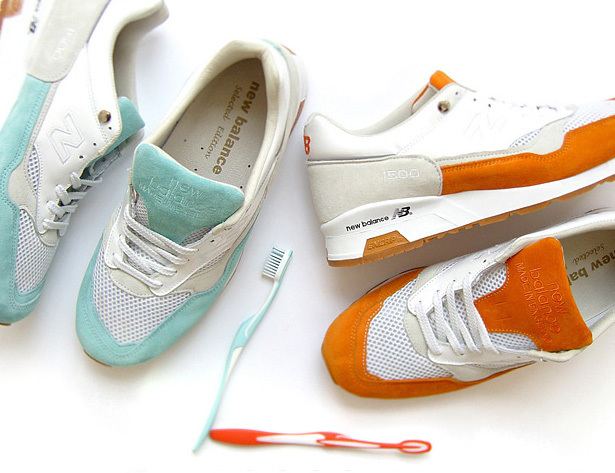 The “Toothpaste Pack” is one of those shoes that you know about even if you’re not into New Balance, or know about Solebox, it seems to appeal to almost everyone interested in trainers. There were 216 pairs of each shoe, and every pair also came with individually numbered studs beside the top eyelet, as well as a matching Solebox branded toothbrush. As you may know, the Solebox brothers were born in Berlin, but they have proud Turkish roots, and these shine through in the 2008 collaboration with New Balance, the “Nazar Eye”. The term “Nazar Eye” also known as “Evil Eye”, is said to protect you from envy/evil, and is mainly based in Turkish culture, however, is common within many other religions in cultures. The shoe itself is a premium Made in England 1500, with soft black tumbled leather on the upper, with suede panels, black mesh toe box, and a grey mudguard. 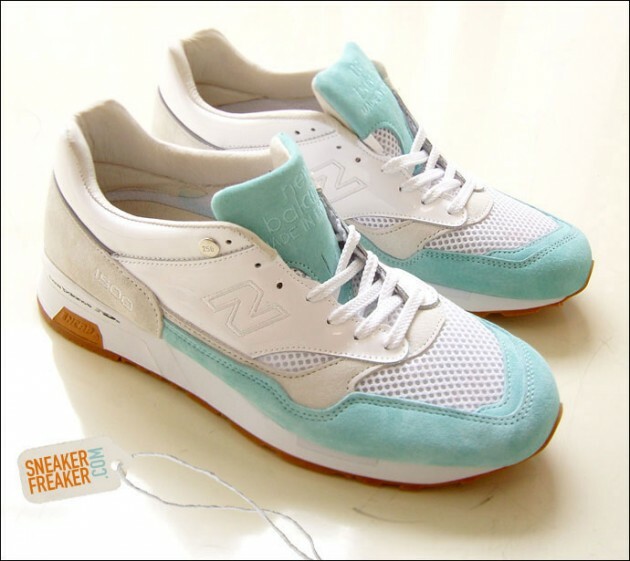 There is light blue stitching for the 1500 and NB heel branding to match the colours of the eye, and the 1500BGT is finished off with a white midsole and gum outsole. Everyone loves the little details, and there is a hint of 3M at the tip of the toe box, Solebox lace locks, and of course, the famous “Nazar Eye” in the form of a lace jewel. 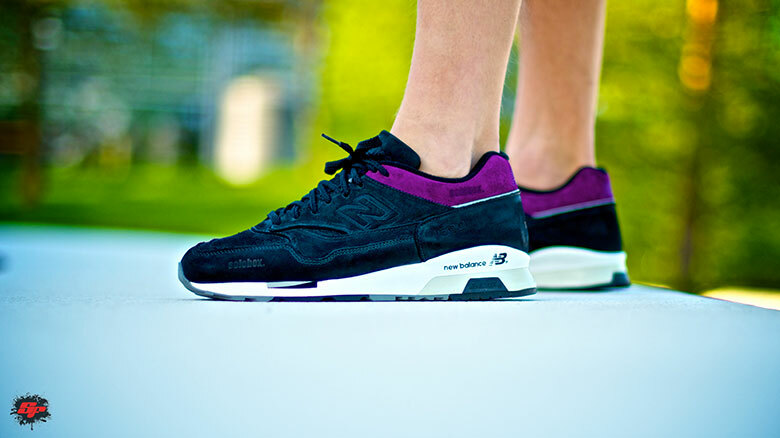 The New Balance 1500BGT “Nazar Eye” was limited to just 204 pairs. Check out the following short interview at the time of the release. As the name suggest, the New Balance x Solebox “Finals” Pack was to be the finale, certainly as far as collaborating on the Made in England 1500 is concerned. 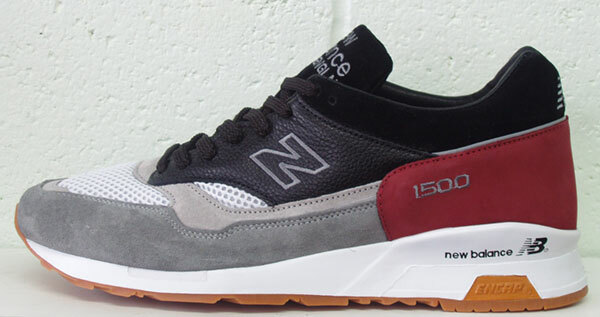 Essentially, Hikmet revisted the first time the brands collaborated (1500GGB), but to avoid copying the first release, the Finals pack consists of two pairs of 1500’s, the 1500MSB, which has a maroon heel sold exclusively at Solebox and limited to just 350(?) 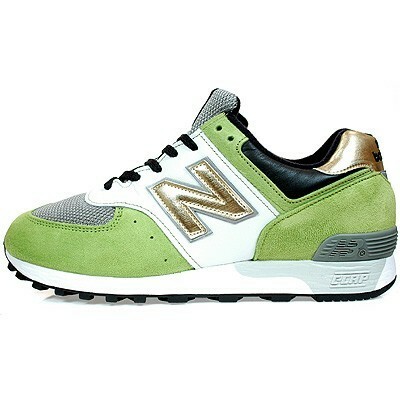 pairs, and the 1500GSB, which has a forest green heel and was available outside of Solebox at select NB retailers for the first time. The shoe uses a mix of nubuck, leather and mesh, all sat on top of that lovely gum sole which Solebox became so well known for using, and also sets the release apart from the GGB. So, that brings us to the end of the New Balance x Solebox collaboration history, but rather than just leaving it there and hoping for future collaborations between these two, let’s take a look at some pictures of samples. I found a lot of these pictures on the Sneakers.fr forum, so have linked them to there, so thanks to those who compiled the images over the years. 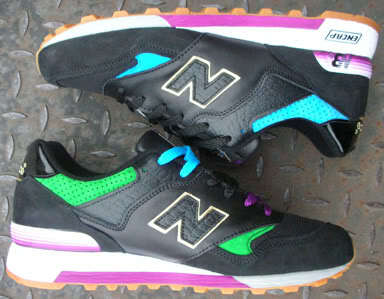 This 576 sample has a very similar colourway to the Nazar Eye 1500, so maybe this was potentially a sample for that collaboration. 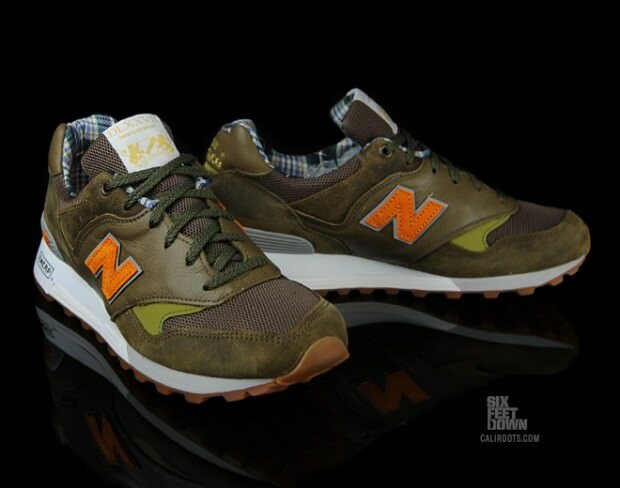 This 575 is a sample from the collaboration with Being Hunted on ‘The Great Outdoors’ Pack, and one side of the shoe is East German Army Camo, and the other side is West German Army Camo. These three 575’s were done roughly around the time of the ‘Purple Devil’ release, but nothing ever came of them and in the end, the red/white 575 was given away in an auction by Slam x Hypebeast. With the Purple Devil Pack having three shoes, it was inevitable that there were going to be a lot of samples, so take a look at all the various samples below. 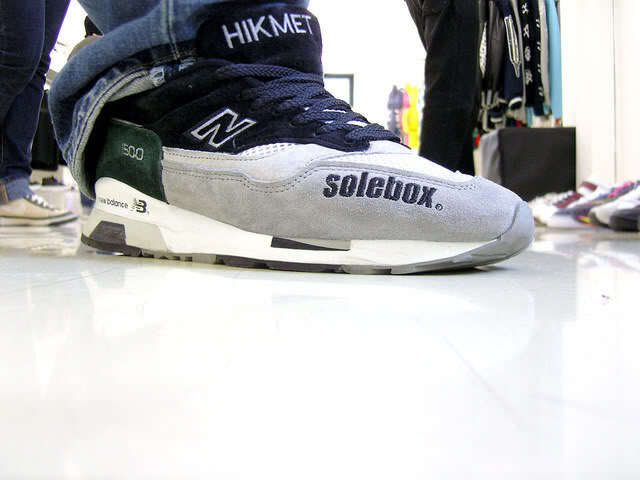 This pair is a personal pair of Hikmet’s with some Solebox branding and “One of One” branding on the tongue and heel. There have been various Toothpaste pack samples appear over the years, and I’ve tried to gather all the ones I’m aware of below. I’m sure you’ll agree that some of these are better than the two released pairs! Originating in Stockholm, Swedish duo Peter and Erik have been in the business for well over ten years now, and are widely regarded as two of the best in this industry. Due to their popularity and successfulness in Stockholm, in 2005 they opened a second store in Malmo, and subsequently took their business overseas and have recently settled in London. With their success came many opportunities, and Sneakersnstuff have collaborated with many brands over the years, having been named as the ‘King of collabs’ numerous times. 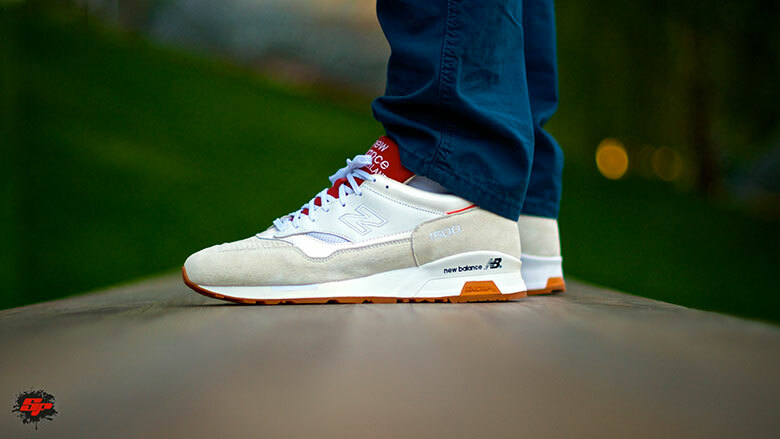 For many years now, New Balance have been collaborating with stores across the globe, but very few have as strong a relationship with New Balance like Swedish heavyweights Sneakersnstuff do. 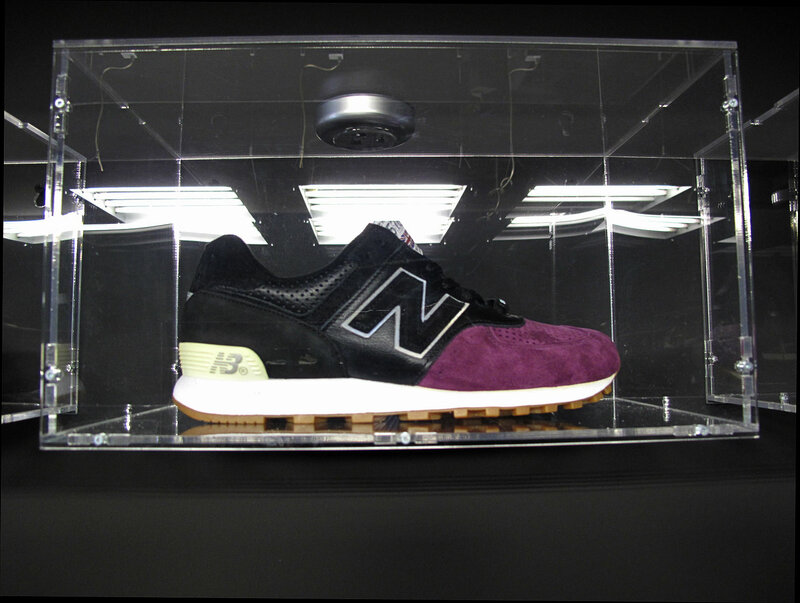 In fact, New Balance were one of the first brands to give Sneakersnstuff the opportunity to do a collaboration. 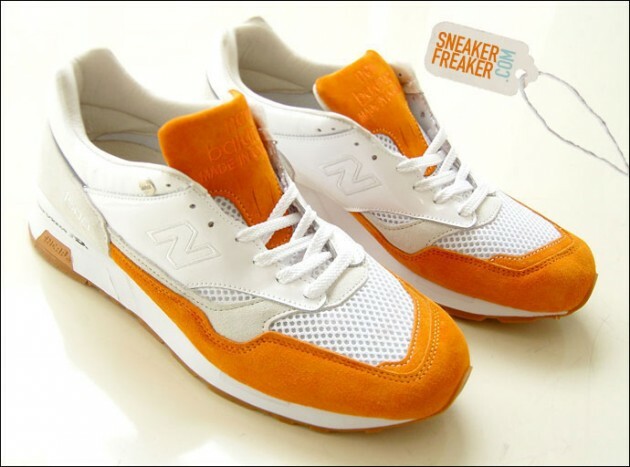 As the title of the collaboration suggests, the first collaboration between New Balance and Sneakersnstuff came in 2005, and it wasn’t without drama, that’s for sure. However, mistakes sometimes pay off and when it comes down to footwear, it usually makes things a little more interesting. The Sneakersnstuff pair were invited to the famous Flimby factory in Cumbria, England, and they knew that the visit was mostly about doing a collaboration, but around this time, it was still relatively early days for NB UK on the collaborating front. After receiving a grand tour of the factory, they had very little time to come up with the designs for these shoes, but knew the model that they wanted to work on, and started to hand pick the materials they wanted to use, so that was a good start at least. 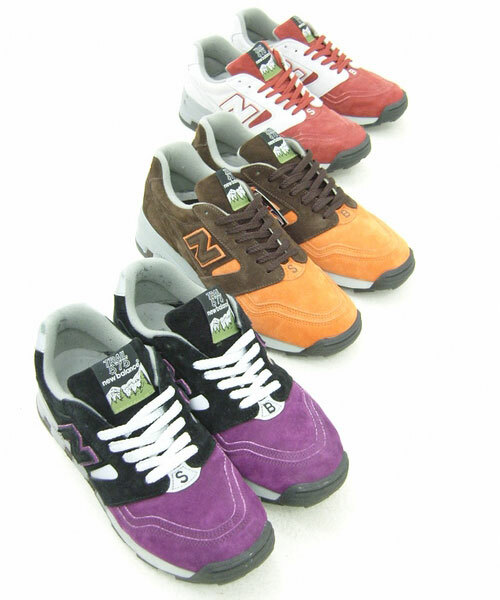 There were only 96 pairs of each colourway produced for the “Round 1” pairs, a time when New Balance collaborations were extremely limited, with sub 200 pairs seen very very often. 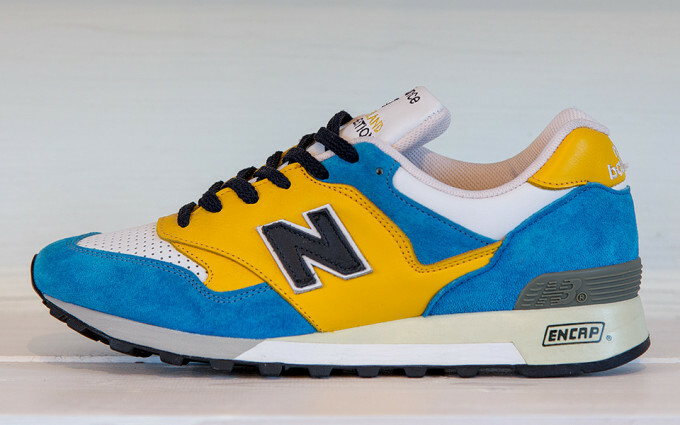 The 577SNS1 was designed by Erik and it draws inspiration from the Swedish flag, and also the flag of the Canary Islands as this was the birthplace of Erik’s father-in-law. The shoe features blue suede, and yellow leather on the upper, with a white leather perforated toebox, all sat on the traditional Encap 577 sole unit. Material options were limited at the Flimby factor, however, they are well known for their premium materials, and we see this on Peter’s design, from the leather toe box to the suede heel wrap. A classic design, which was slightly inspired by the classic 577 in navy and the 997 in grey, uses all these colours and a clean white leather toe wrap and perforated toe box with mixes of suede on the rest of the upper. As I mentioned previously, the first collaboration wasn’t without drama, and the SNS guys got a little more than they had originally bargained for. 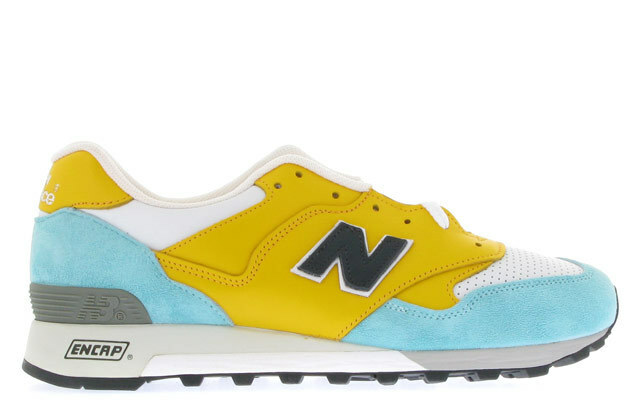 As can be seen in the first 577SNS1 posted a couple of pictures above, Erik’s Round 1 samples were blue and yellow, they way he designed them, but when they received the pairs, Flimby had changed the blue to more of a mint green and also added some more yellow to the shoe. It wasn’t the shoe Erik designed, but they decided to release them anyway, but rather than releasing pictures of them prior to launch, they had a countdown clock on the Sneakersnstuff website for ‘The Secret 577’. Unfortunately, some pictures managed to leak a few minutes before the launch, but the shoe was well received and all 96 pairs sold out. Two years on from their first collaboration, they were back, and once again, revisiting the 577, a model which had quickly became one of their favourites from the New Balance arsenal. This time, rather than the original 577 sole unit, they wanted to do something different and have an all white sole unit (outsole included), which wasn’t exactly received well, but it works, and compliments both colourways extremely well. Both colourways were produced in 252 pairs each, so there were 504 pairs in total for the set, which was quite a lot at the time of release but unfortunately this had to be the number as it was the minimum for a new sole unit then. For Peter’s colourway, he used the same premium synthetic leather which was used on the original 1500, along with some premium pig skin suede. 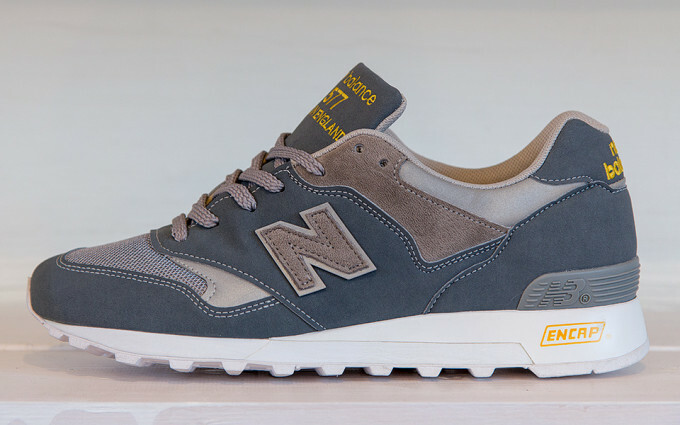 The yellow New Balance detailing is a nice touch and looks good against the bluey/grey colourway. 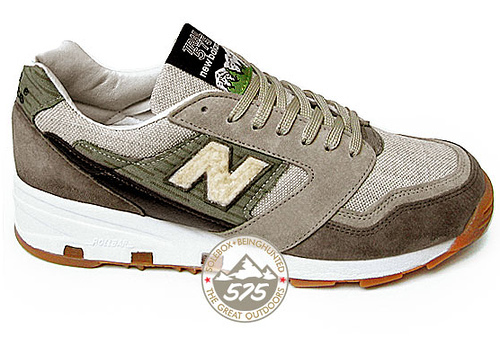 The 577GPI is arguably one of the best 577’s around, that earth tone colourway works perfectly and it has some of the best materials ever used on a New Balance. One unusual touch on this shoe is the pink lining, and unfortunately, this wasn’t available at Flimby so Erik had to source the pink silky smooth lining himself. There was a bit of a familiar theme by the time the third round of collaborations came about, I guess that was one of the benefits of having two people behind a store – two shoes each time, and often two very different takes on the colourways. For the third round of the New Balance x Sneakersnstuff collaborartions, did you really expect them to work on any model other than the 577? Not a chance, it was almost a tradition by this point, but a very good one at that. Much like “Round 2”, Erik and Peter wanted to change up the midsole a little, and now Flimby had the ability to create a midsole that was different to the traditional 577 midsole without having to produce larger quantities of the shoe. This is why “Round 3” has a smaller production run of 150 pairs each, in comparison to the 252 pairs each for the last round. As you might have gathered by now, Peter likes to keep his colourways simple, but always with the most premium of materials, so for “Round 3” he did a black upper with mostly suede, but also some leather and hints of 3M. Similar to an artist signing his work, Peter darkened the ‘P’ of the ‘ENCAP’ on the midsole to mark his pair. Much like his “Round 1 and 2” colourways (577SNS1 and 577GPI), Erik pulled together something a lot more colourful. 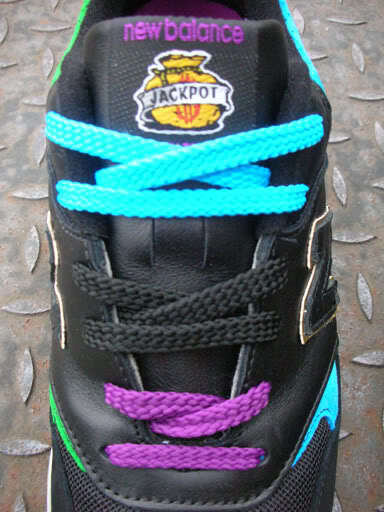 The shoe features a lime green, light blue, and navy blue suede upper, along with a purple mesh toe box. Similar to Peter’s pair, he also went for the signature touch on the midsole, highlighting the ‘E’ from the other letters, and also doing the same to all the ‘E’s’ on the tongue. Make sure you check out this interview via Sneakerfreaker with Erik and Peter regarding the “Round 3” collaborations with New Balance. This time, SNS teamed up with New Balance to produce this pack in celebration of their tenth anniversary after they first opened their doors in 1999. The pack duped the RGB Pack (red, green and blue – simply the three colours used to render colours in an electronic display), consisted of three different models; 577, 1500 and 1700 – red, green and blue, respectively. This was the fourth collaboration with New Balance that Erik and Peter worked on, and if it wasn’t already evident that they were the masters of materials, then this pack confirms it. 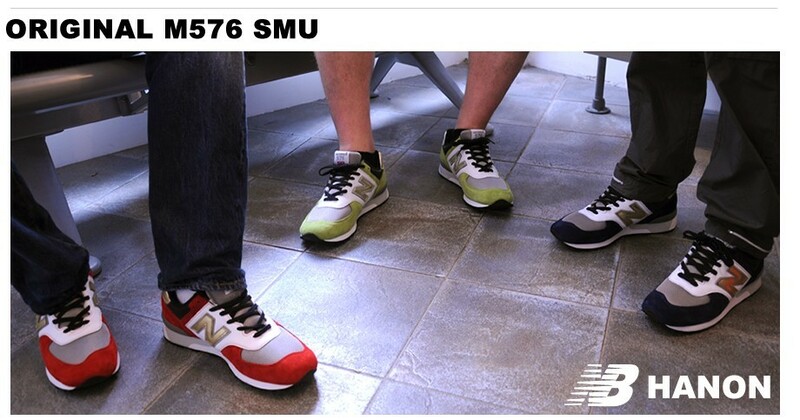 The guys at SNS each worked on a shoe individually; Peter worked the 577, Johan the 1500 and Erik the 1700. The three shoes were Made in England at the legendary Flimby factory, and all consist of the high-grade premium materials that were consistently used around this time. They also sport the very sought after ‘original shape’ if you must, which makes them just that little bit more delightful. 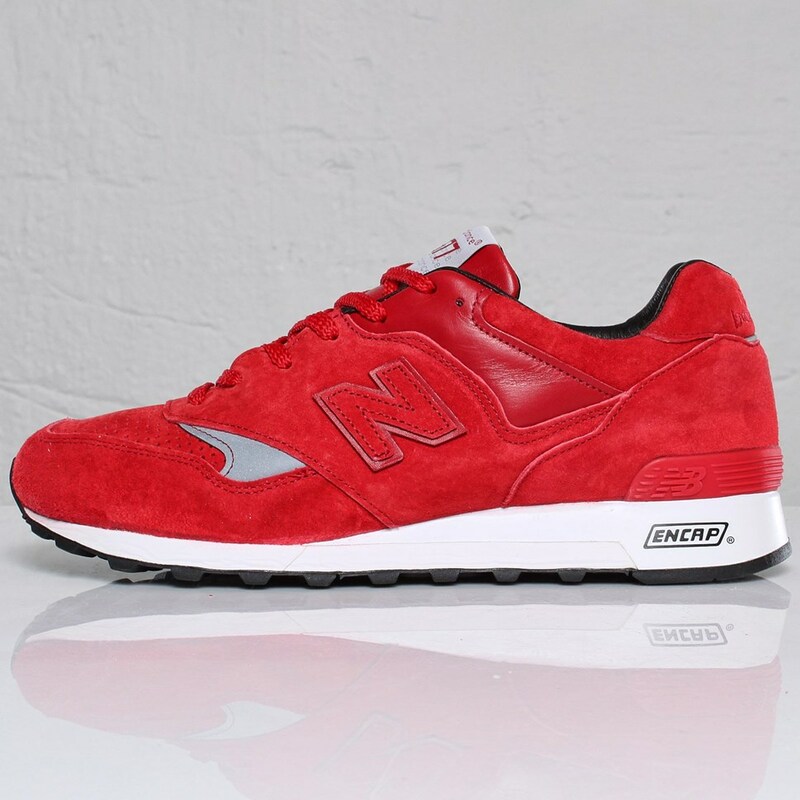 The 577 is decked out red suede and leather, has a pigskin perforated suede toebox and some 3M flashes for good measure, and of course, represents the “red” of the “RGB Pack”. 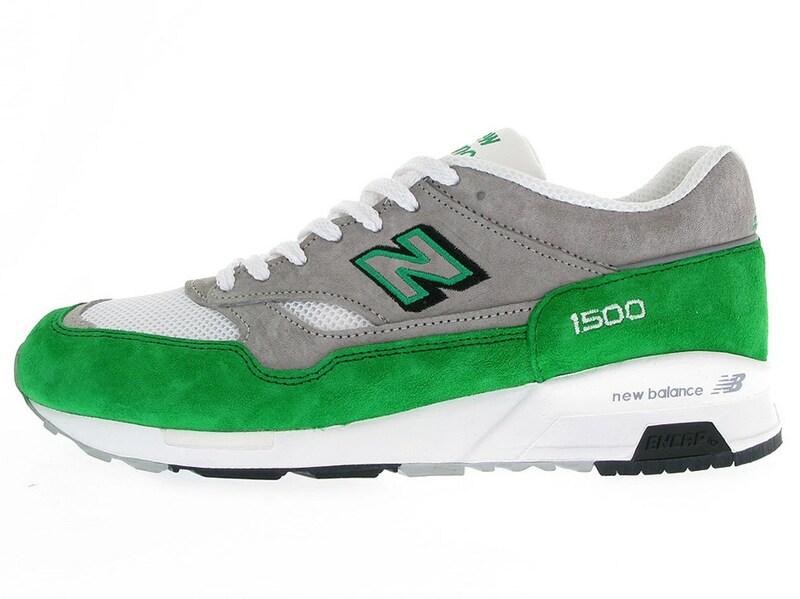 The 1500 has some plush leather on the tongue, and a mainly suede upper in green and grey, with a deep white mesh toe box and some 3M piping, and represents the “green” of the “RGB Pack”. 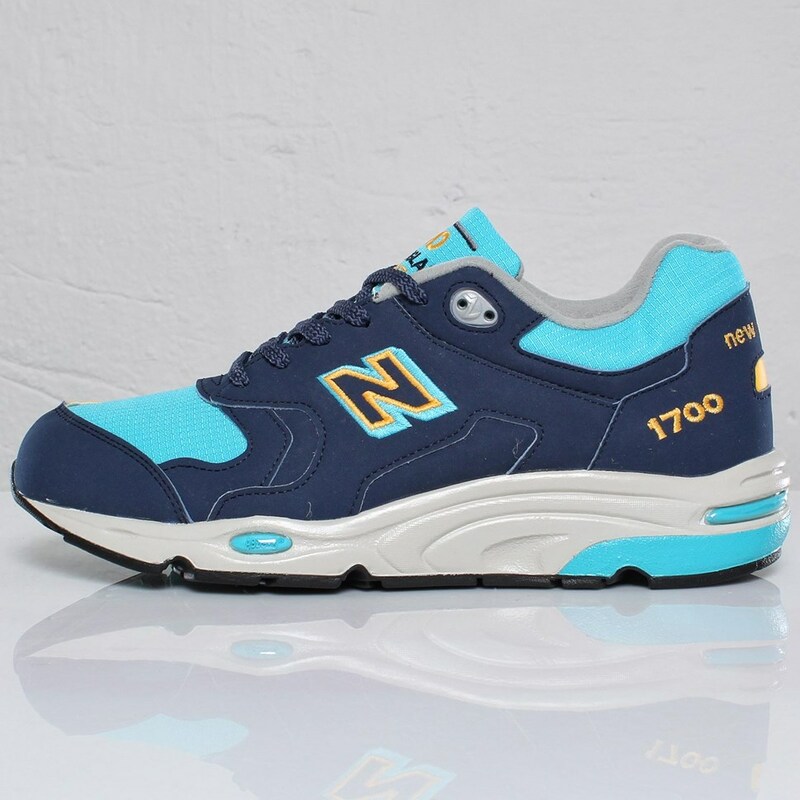 The 1700 comes in a couple of shades of blue with some yellow, and features to the ripstop upper and faux nubuck but the man-made materials are completely vegan, so a perfect shoe if you’re into that and/or appreciate the diversity. This pair represents the “blue” of the “RGB Pack”. 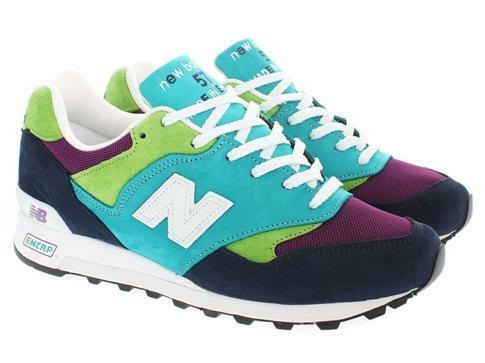 Check out the below image from EU Kicks of the full New Balance x Sneakersnstuff “RGB Pack”. For Sneakersnstuff’s fifth collaboration with New Balance, they revisited the 577, which they are particularly well known for using in their earlier collaborations, a favourite model of theirs indeed. This time they partnered up with Aaron LaCrate of Milkcrate Athletics, and Baltimore meets Stockholm to produce two 577 make-ups. The collaboration comes about through friendship and also a mutual love for footwear, and both sides agreed to have two separate colourways, one of which represented Milkcrate Athletics, and the other represents Sneakersnstuff Stockholm. 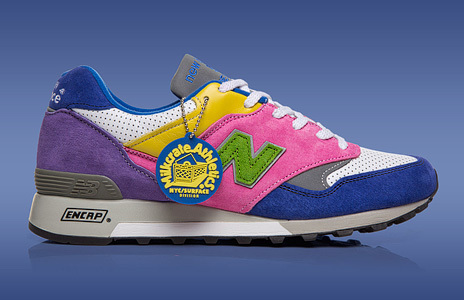 The New Balance 577SN1 is “Easter egg-colourful” and if you were to hazard a guess, 99% of you would probably work out that this was the pair put together by Aaron of Milkcrate. Aaron’s refreshing and vibrant personality and style shines through on this pair, decked out in pastel coloured suede, and some white perforated leather. 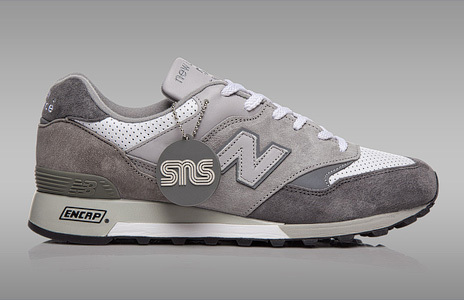 The SNS side of the collaboration comes correct with a subtle grey colourway, very traditional of New Balance as a brand itself. 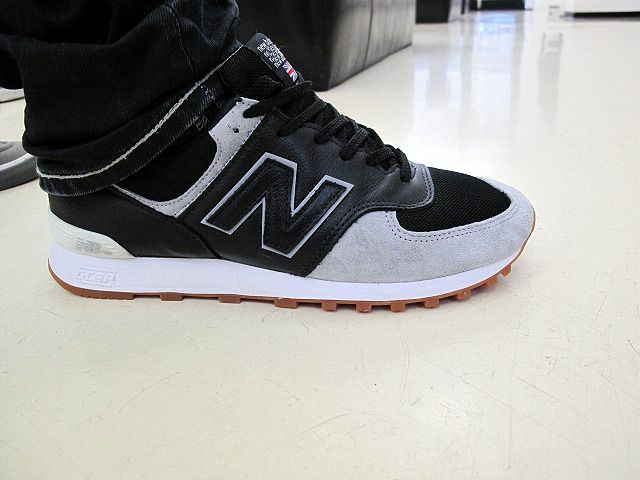 Lush suede and white perforated leather is also used on this pair, mirroring the 577SN1 except for the colourway. Check out the following video for the collaboration with a little insight into the relationship of Milkcrate and SNS, and also some details about the 577’s. Gary Warnett of Crooked Tongues interviewed both Erik and Peter of Sneakersnstuff, and also Aaron of Milkcrate Athletics, ahead of the release of this shoe, so be sure to check it out here, as it makes for a very interesting read. 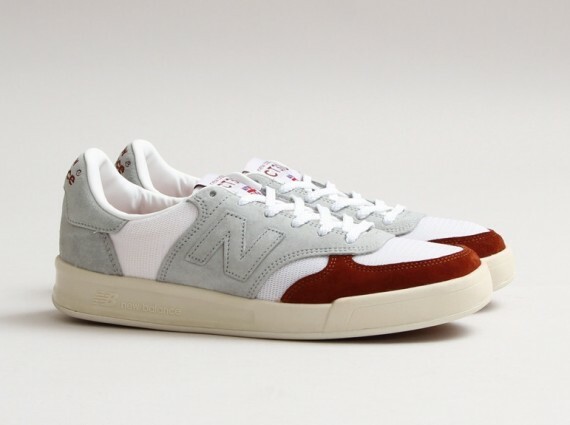 So, this collaboration with New Balance is a little bit different from all the previous ones, because instead of working on an archive running model, NB proposed the CT300, a Made in UK tennis shoe which was first released in 1979. 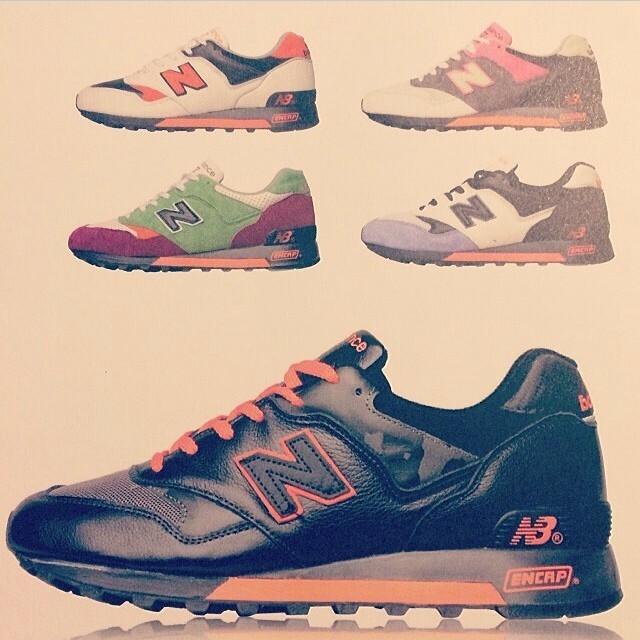 This collaboration would come as a part of a set of 4, alongside make-ups from hanon shop, Firmament and 24 Kilates. The CT300 features an extremely lightweight upper, which consists of closed mesh and suede overlays. It is also built with superior cushioning and the unique sole unit of polyurethane and encapsulated gum rubber provides great durability. Diving into the archives and bringing back a piece of history seemed like a good opportunity for the SNS guys to revisit how their Stockholm store first looked in 1999. When the Stockholm store was first opened in 1999, the walls were painted grey, a colour more subtle than white, and one which would distract attention away from the products. The store wasn’t exactly the largest space, so to make it feel bigger, the ceiling was painted white, and a burgundy border was added at the top of the walls. So that’s the inspiration behind the colourway, and add in the premium materials, which are typical of the Flimby factory, and you have a great shoe. 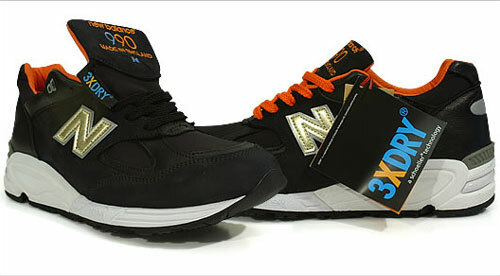 Be sure to check out the below video for the New Balance CT300 collaborations. So the most recent New Balance CT300 collaboration rounds up the Sneakersnstuff collaboration set, but I’m sure that this isn’t going to be the last with New Balance, maybe we’ll even see them revisit the 577? A lot of brands and stores try to bring out shoes that are inspired by a storyline, or some sort of inspiration, but excluding a couple, it’s nice to see people just designing shoes based on what they like. Also, Round 1 to 3 are probably some of the strongest pairs of New Balance, and the way that Erik and Peter work independently on the uppers and then try to tie together the sole units works perfectly, and gives some amazing results. Here’s to more collaborations and success from the Sneakersnstuff team! As 2014 marks the 10th anniversary of collaboration history with New Balance and hanon shop, it seemed like a fitting idea to start from the very first collaboration and work through to the present. 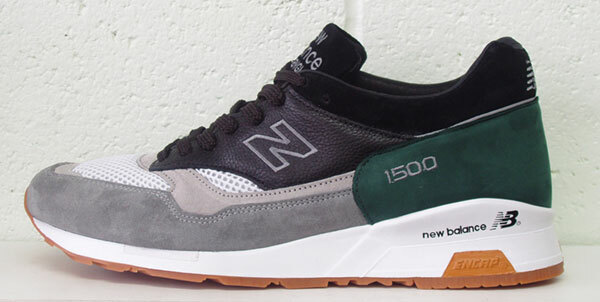 The timing of this article also ties in perfectly with the upcoming New Balance CT300 collaboration which releases on the 27th of June 2014. Being from Aberdeen myself, hanon shop is my local store, so their past, present, and future work has always been a keen interest of mine, which is why I’ve put this article together and hopefully been able to round up the 10 year journey and add in some little extra bits or content that people may not have heard or seen before. The first ever hanon shop x New Balance SMU (Special Make Up) was originally designed and released in 2004, with each pair limited to 196 pairs, but has also seen a vault release a few years later in 2007 along with some strange stories of some of these pairs popping up in outlets, and other places, but we’ll get to that later. Anyway, the hanon shop team reworked one of their favourite New Balance models, the classic 576, and they designed the upper with a mix of suede, full grain leather, air flow mesh, contrasting white saddle, and that traditional and noticeably familiar gold ‘N’. So in 2007, hanon shop announced a release called ‘The Vault’, which included left over pairs and a short run of the green model from the allocated release, meaning that all three were essentially released as a pack, albeit three years later. 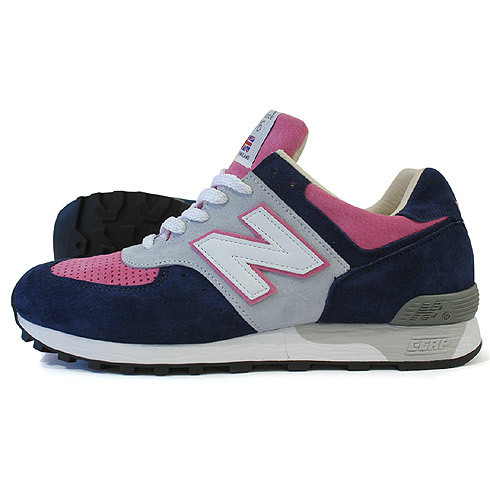 Still to this day, there are pairs of women’s 576 in the colourway above popping up around eBay, but hanon never ordered or sold a women’s version. 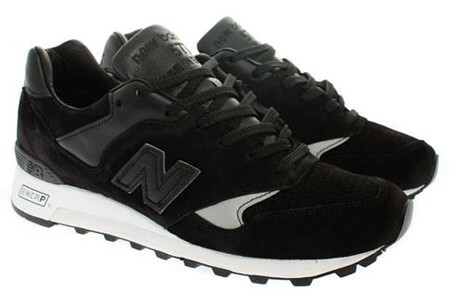 The New Balance 576HBA was one of hanon shop’s first collaborations with New Balance, and many rank it extremely highly although it is probably not as well known as some of the others. The shoe features a predominantly black leather upper, with royal blue mesh underlays, black suede heel tab, gold ‘N’ with 3M backer, all sat on a slightly grey C-cap midsole. They were released on October 28th 2005, limited to only 198 pairs and came with a certificate of authenticity, with a retail price of £69.95. A year on from hanon’s first collaboration with New Balance, they were back again, but this time with a silhouette which debuted in 1998, but one which many may not have been familiar – the 990. The New Balance 990HBW was designed with a colourway unique to the shop, and featured a clean suede and mesh upper, with trademark gold ‘N’ which was popular on the early collaborations. They were released on November 22nd 2005, limited to only 198 pairs and each came with a certificate of authenticity. 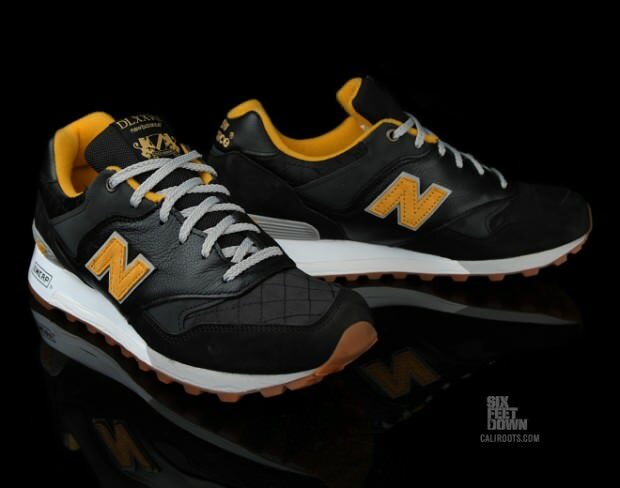 Both the New Balance 576 and the 577 hold special places in the hearts of lovers of the brand, as well as the brands archives itself, so when someone collaborates on that model, there’s always a huge amount of expectation in the air for them to be great. In 2006, hanon Shop and New Balance worked on two 576’s and two 577’s to create the Northern Sole Series, which would pay homage to and refer loosely to some of the guys at hanon’s favourite Northern Soul patches that had been collected by the Soul boys from the clubs they visited. 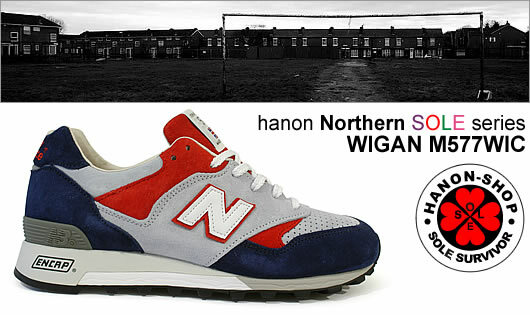 Hanon’s Northern theme is also a tribute to the massive influence that the Northwest of Britain has had within trainer culture generally, a legacy that spread from the 1970s football terraces to the Madchester era of The Hacienda and on to the present day. The uppers of each shoe consists of a mix of premium suede, leather and nubuck, with parallel perf details and finished with plush pigskin lining, and of course the 577’s are sat on Encap sole unit, while the 576’s on a C-cap sole unit. These 4 shoes really show what Flimby was capable of in terms of materials, shape, quality and construction. 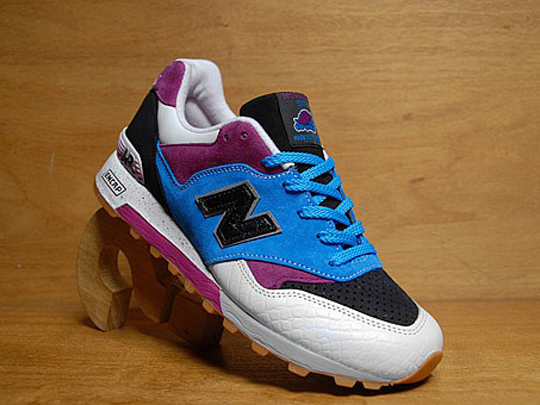 Part one of the New Balance x Hanon Shop Northern Sole Series collaboration will be coming on April 2006. Included in this collaboration will be the Chosen Few M576CHF and the Wigan M577WIC. 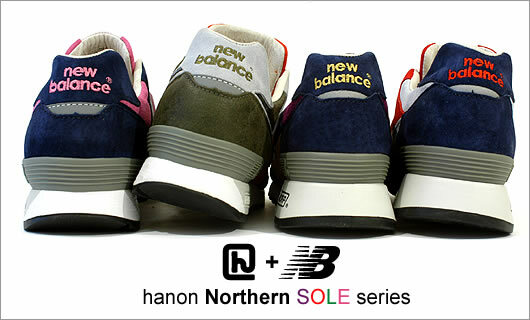 Part two of the New Balance x Hanon Shop Northern Sole Series collaboration will be coming on May 2nd, 2006. Included in this sequel collaboration will be two beautiful sneakers, the Soul City M576SOC and the Night Owl M577NIO. Each pair from the hanon Northern Sole series was limited to 120 pairs per style, and came with a badge and hand numbered post card set featuring photography by Brian Sweeney. 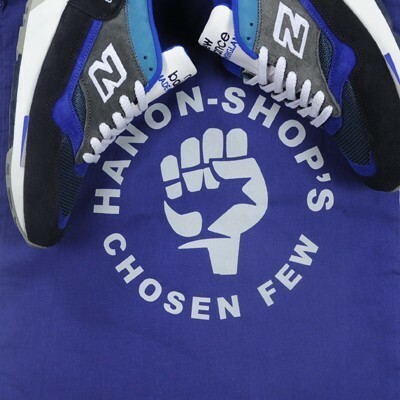 The New Balance 990HSN x hanon shop x Schoeller is probably my personal favourite of all Hanon Shop’s collaborations with New Balance spanning their 10 year history working together. 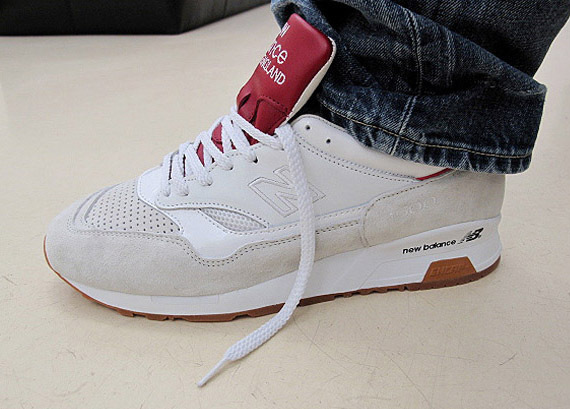 This shoe was to be the second 990 collaboration between hanon shop and New Balance, following the New Balance 990HBW which was released a couple of years prior. As always, another impressive make-up, and a perfect shoe for the Scottish weather. Through the use of Schoeller technology, a Swiss based company known for producing high technology textiles, this would provide the shoe with a highly functional and technically outstanding upper. The Schoeller 3XDRY provides moisture management, stimulates a cooling effect, and repels water and stains, so essentially it keeps your feet dry, allows them to breathe and you can wear them in the rain with no worries! 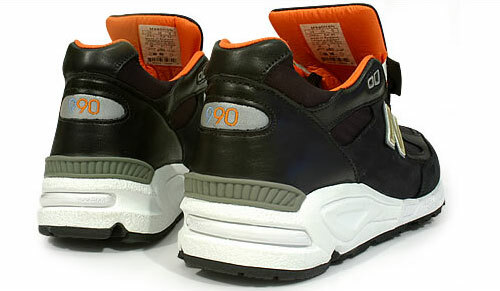 Moving away from the Schoeller technology, the rest of the upper features full grain leather and nubuck overlays, pigskin leather footbeds, 3M N underlay, safety orange lining and the ‘USA’ on the heel is replaced with ‘990’. The shoes were released on April 28th 2007 at hanon shop, limited to 144 pairs only at £89.95, and each came with a Hanon authetication certificate, and two lace sets – black, and orange. All pictures from hanon shop. Four years on from their first collaboration together, and they were back with a bang, as their newest collaboration named The Flying Club was to be launched in August 2008. 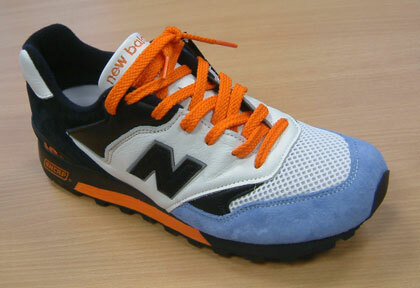 This pack, the ‘670 Squadron’ featured two New Balance 670’s, an archive running shoe from Flimby’s vast catalogue. However, these shoes were to be made with a twist! Not only did hanon shop team up with New Balance, but they also teamed up with Ventile, who are a British company renowned for the production of their superior 100% cotton all weather material. The guys at hanon shop found the origin and application of the fabric fascinating and felt that it would be a perfect choice to be used on a archive running shoe. The smart-fabric material handles like a quality chino or a M-65 military jacket and has a dense weave that when in contact with water expands to produce a virtually weatherproof membrane. It’s almost a thing of the past for brands to be producing shoes in such low minimums, but this meant that they could be produced to outstanding build quality, and also high quality materials like Ventile were able to be used on the shoes without the cost being largely affected. The Flying Club draws it’s inspiration from the simple aesthetic of the 1970’s and 1980’s styles and succeeded in reintroducing some old school touches which reflect and compliment the heritage of Ventile. The shoes were constructed in the Flimby factory and feature 100% cotton Ventile premium underlays, bounded and unbagged vintage mesh tongue, bespoke tongue label, single piece N, and unbranded back tab. They also have suede pigskin overlays and Wolverine Leathers for the areas which are not covered with Ventile fabric. 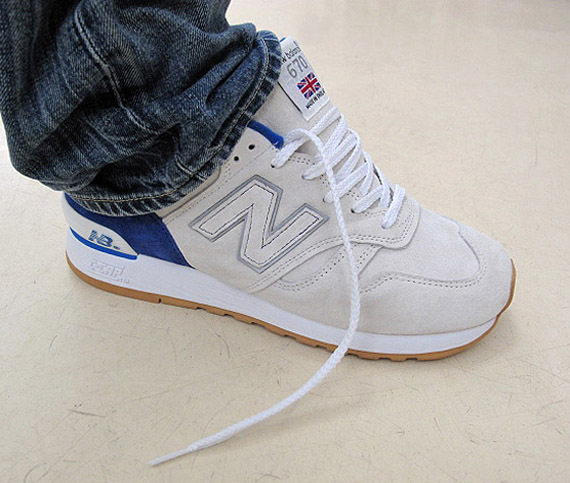 The particularly ‘worn look’ on the shoes is great, with the retro slightly thicker cotton New Balance laces, and the aged midsole. 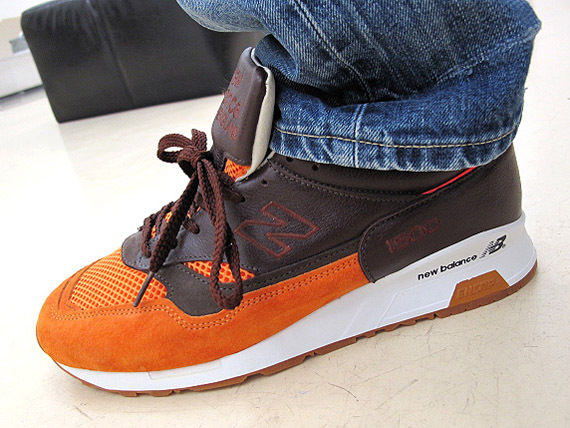 Here’s a nice little interview with Sneaker Freaker and Ed Toft of hanon shop. – Hanon Flying Club Interview. 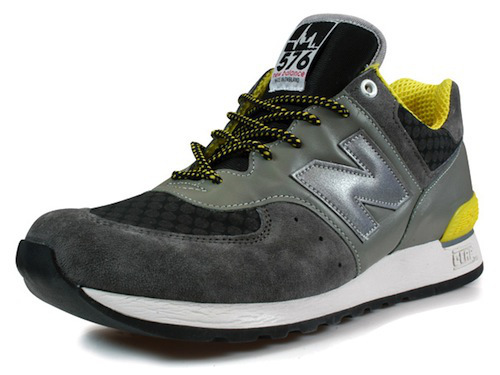 One half of the 670 Squadron, the New Balance 670GKY ‘Tornado’ featured a predominantly grey upper with yellow ‘N’. 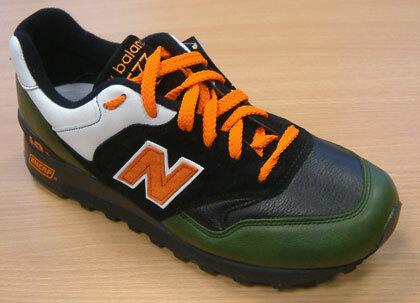 The second half of the 670 Squadron, the New Balance 670BRY ‘Spitfire’, which features a predominantly black and red upper, but also with a yellow ‘N’. Each shoe was limited to 150 pairs, and released in September 6th 2008 with a retail price of £74.95. 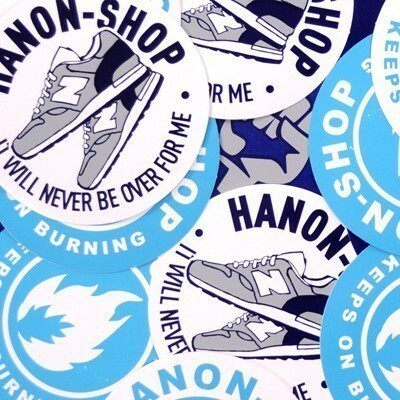 All pictures taken from hanon shop. Above are some old school videos from the time when the Bionic Project was about to release, and they’re well worth a watch if you like to see inside the Flimby factory and check out some of the processes for making the shoes. 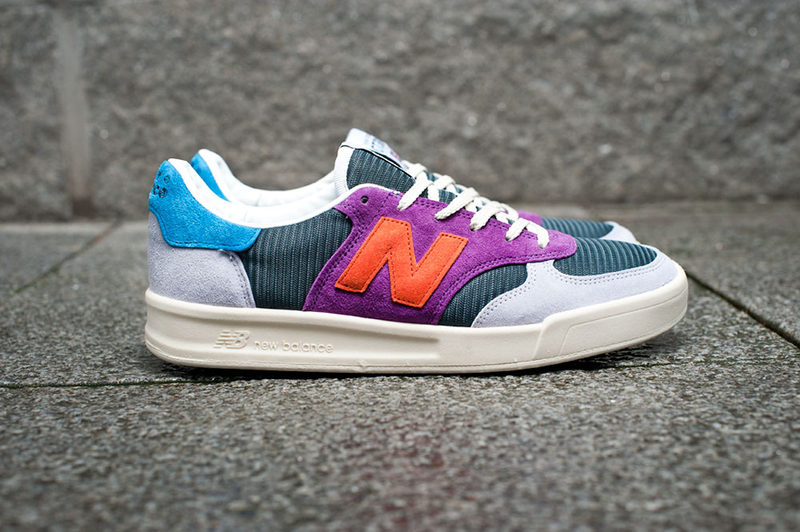 The Bionic Project with New Balance was the 7th collaboration with hanon shop, and much like the hanon Flying Club pack where Ventile fabric was used, this project features another fabric – Eschler fabric Ceramic E3+. There was to be two shoes, named ‘Majors’ 576BMD and ‘Austin’ 576SMD. 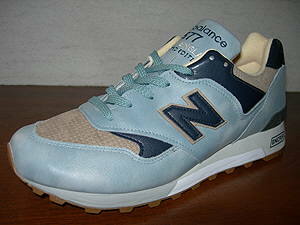 The ‘Majors’ pair had a colourway of white, grey and blue, while the ‘Austin’ pair had a colourway of grey and yellow. The Bionic theme focuses on the concepts of hybridisation, synergy and advanced fabric technology. In terms of hybridisation, synergy and advanced fabric technology, the Bionic shoes feature a 576 upper with a combination premium leather and suede by Wolverine, and Eschler ceramic disc printed underlays and a 3M N logo and heel panel. This upper is then mounted on a 670 footbed and finished off with a bound tongue with a custom Bionic woven label, and full airflow mesh lining. Each shoe came with 3 lace sets, including a round flecked hiking style lace, which reflects the distinctive disc pattern of the Eschler fabric. The shoes teaser videos released in December 2009, but the shoes eventually went on sale in March 2010 and had a retail price of £79.96. In a way, this pair was, and it wasn’t a collaboration with hanon shop, either way, it can’t be ignored for the purpose of this article. 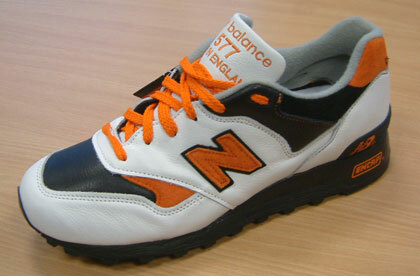 The UKG is Flimby made 1500 and an anniversary colourway that has featured numerous times over the course of NB history. 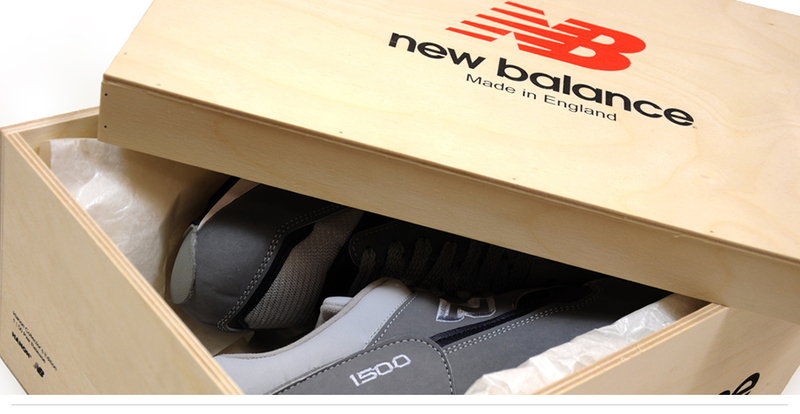 Basically, the 1500UKG would be available in a limited edition 1 of 50 beautifully crafted screen-printed wooden box, which could be purchased only at hanon shop on the 23rd of October 2010. 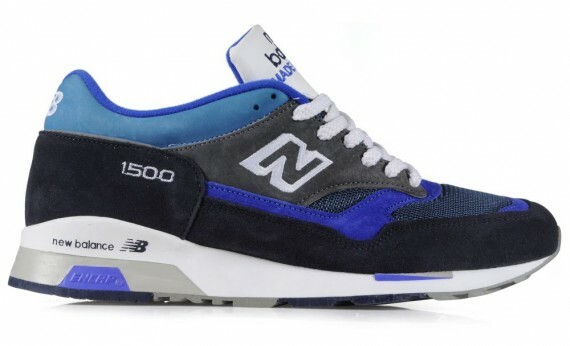 Much like the New Balance 1500UKG and the special boxed edition exclusive to hanon which released the year previous, in 2011, the stunning New Balance 1500SGB was released along with a special collector’s edition box. 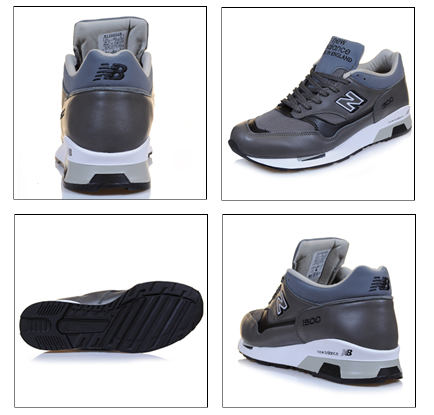 This shoe is a Flimby made 1500 with all leather and mesh uppers, and came in a gun metal grey and black colourway. The 1500UKG was available in a limited edition 1 of 100 beautifully crafted screen-printed wooden box, which could be purchased only at hanon shop in A/W of 2011. 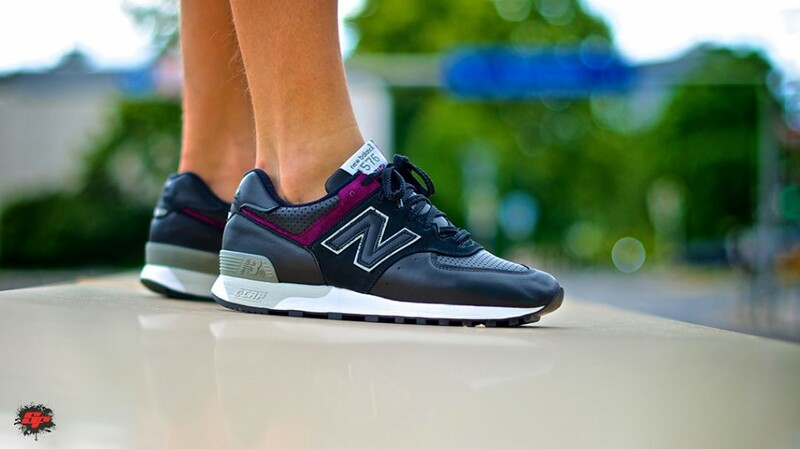 In recent times, there hasn’t been much in the way of New Balance collaborations with any of the ‘big hitting’ European stores, or the original stores which New Balance collaborated with many years ago, however, 2012 marked a change from the norm. The Chosen Few 1500 was massively anticipated, and is still widely regarded as the best Flimby made release in the last 3/4 years, and it’s no surprise really, considering this seems to be the only shoe that made it out of Flimby with the original 1500 shape, and not the new and apparently ‘more structured’ version that is produced today. Hanon had made a name for themselves with their ability to never fail to deliver a great collab, and this one was no different. 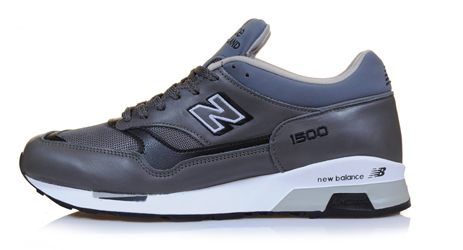 For this one, they reworked the 1500 running shoe, which was an original 1989 release and is widely regarded as a staple piece in the New Balance model archive. The shoe features an a mix of premium navy and grey suede overlays from Wolverine USA, as well as archive mesh underlays and synthetic fabrics. The upper is constructed with a pig suede saddle, bovine heel and tip overlays, which are offset by a teal green mesh apron, cobalt blue felted collar and tongue backer, and then finished off with a single needle white embroidered ‘N’ logo. The shoe was set to come with 3 lace sets in grey, navy, and white, along with 3 vinyl stickers, and a dust bag. Also, for the first few lucky instore customers on Friday 31st of August 2012, they would receive a special wooden box limited to only 50 pieces, and a NB Flimby polo-shirt limited to 10 pieces. 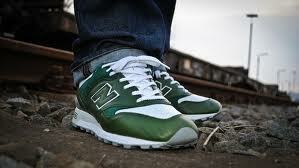 Picture taken from hanon shop. So we’ve had shoes, we’ve had boxes, what about tote bags? 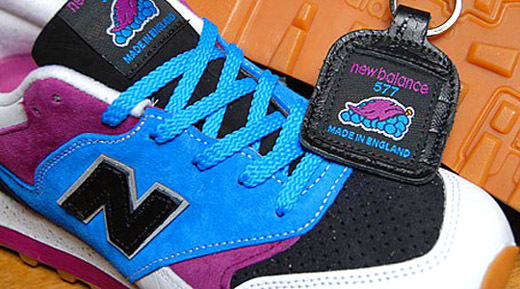 During a little bit of a collaboration drought with hanon and New Balance, they switched it up and dropped two limited edition tote bags (200 pieces each), which available for free when a ‘Made in England’ New Balance was purchased. 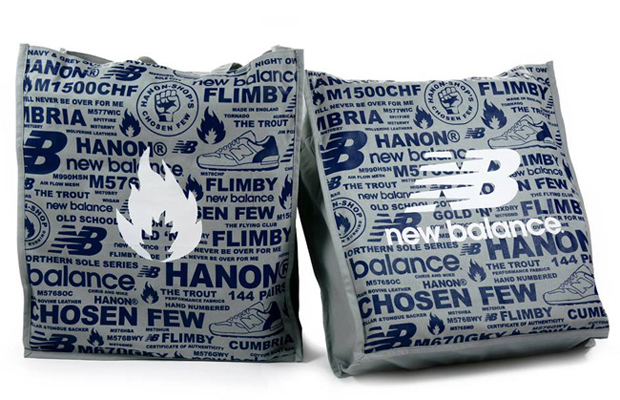 The tote bags were canvas, silk screened and available in two of New Balance’s most iconic colourways – grey/blue, and blue/grey. 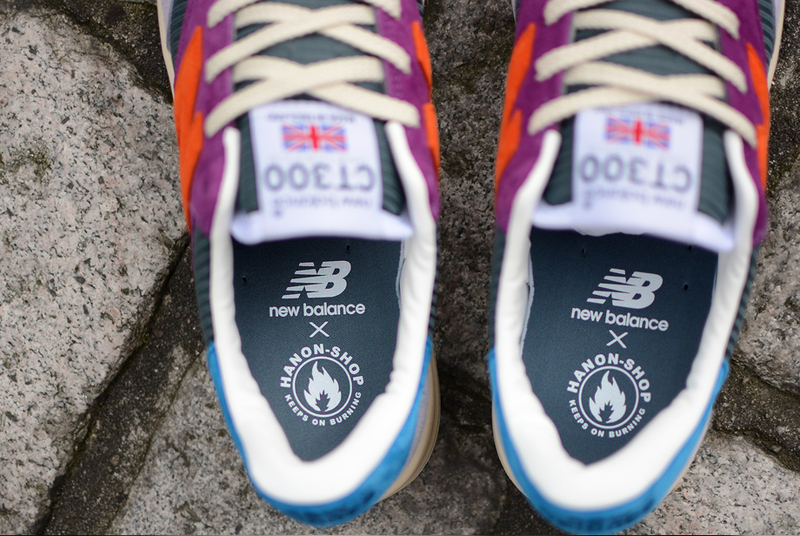 They pay homage to hanon’s collaborative history with New Balance and the Flimby factory, with one side featuring Hanon’s traditional flame logo, and the other featuring the New Balance logo, along with the text referencing some memories since their first collaboration in 2004. However, if you are like me, then you may have examined the tote bags closely and noticed some references that never really made sense, well, at least in terms of shoes that were released. For example, the text ‘The Trout’, ‘M670HUR’ and ‘Hurricane’ were printed on the bags, but I may be able to make sense of a couple of those. The 670HUR and Hurricane may in fact be the same shoe, and it might have been a third pair sample to the 670 Squadron – Flying Club Pack from 2008 which featured two shoes, the Tornado and Spitfire. 2014 marks the 10th anniversary of hanon shop’s collaboration history with New Balance, and in celebration, they take a step away from their usual running models to work on one of New Balance’s first tennis shoes. They teamed up with 3 more of New Balance’s earliest partners, Sneakersnstuff, Firmament, and 24 Kilates to produce a special edition of the Court 300 tennis shoe. The CT300 was first released in 1979, and features an extremely lightweight upper, which consists of closed mesh and suede overlays. It is also built with superior cushioning and the unique sole unit of polyurethane and encapsulated gum rubber provides great durability. 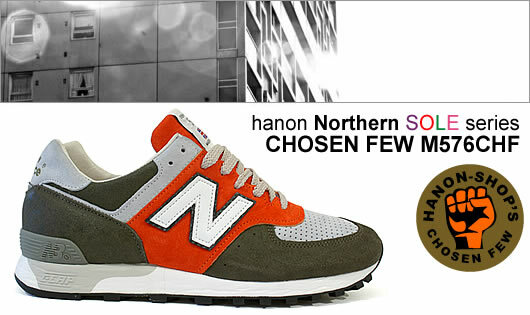 Much like 2006 and 2012, hanon have revisited the Northern Sole theme that has proved to be so successful for them, and they’ve drawn inspiration from the bright colours of patches and album covers associated with the Northern Soul music scene. The shoe has been named the ‘Phoenix’ and the colourway is a mixture of rich purple, soft grey, and blue pig suede, which is then all offset with closed mesh in dark marine. These will be available instore at hanon shop on the 27th of June from 10am, and available online at 2pm with a RRP of £105. They also come with two sets of laces, a silk screened dust bag and vinyl sticker set, which can be seen in the below picture. 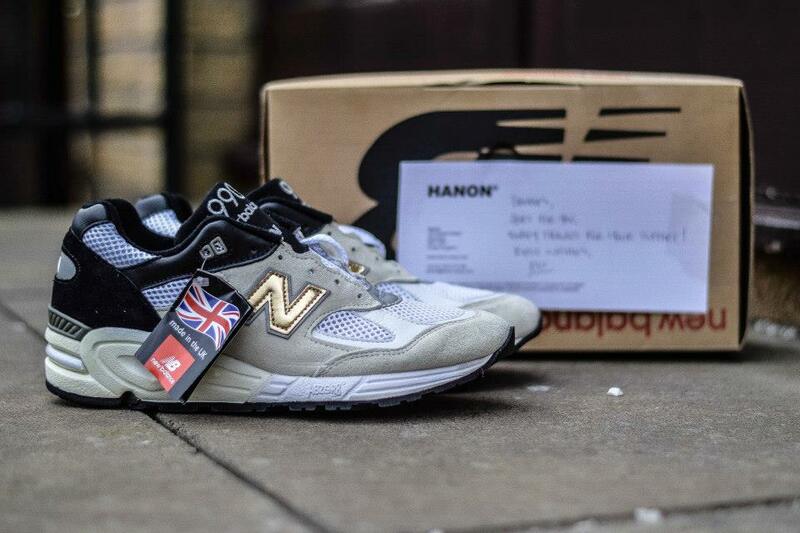 That brings us up to the present day and ends our journey through the hanon shop collaborations with New Balance from 2004 to 2014.
hanon shop have been known for many years now for their ability to consistently produce excellent collaborations, and the above content proves just that, so a big shout out to everyone at hanon, and hopefully there will be many more collabs in the future.